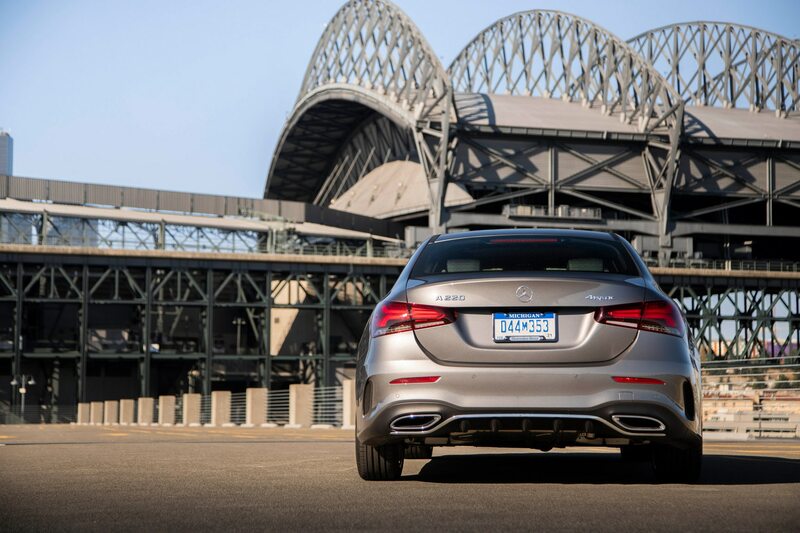 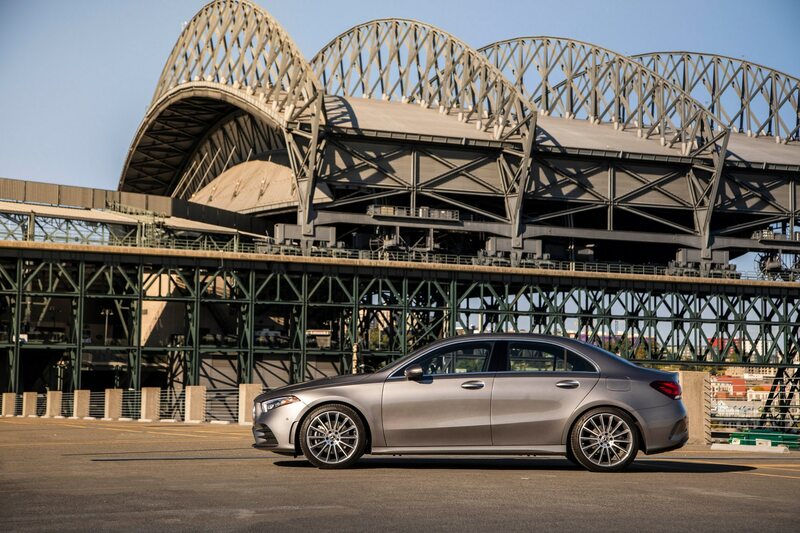 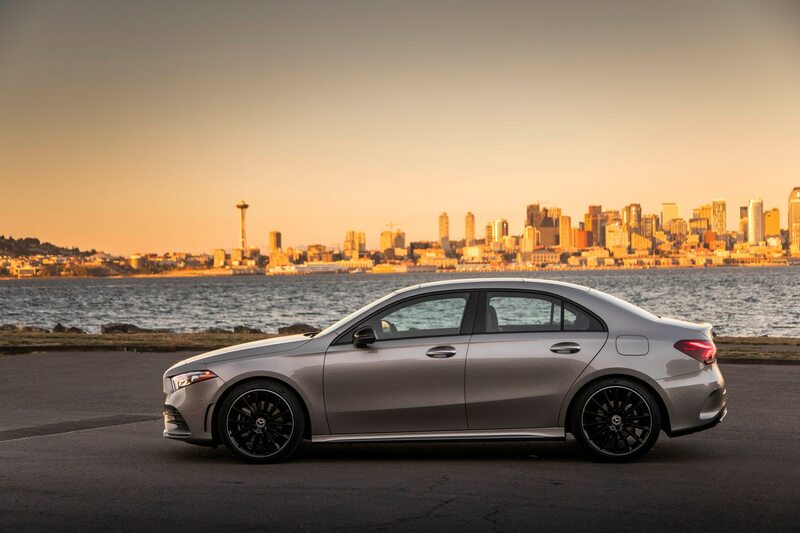 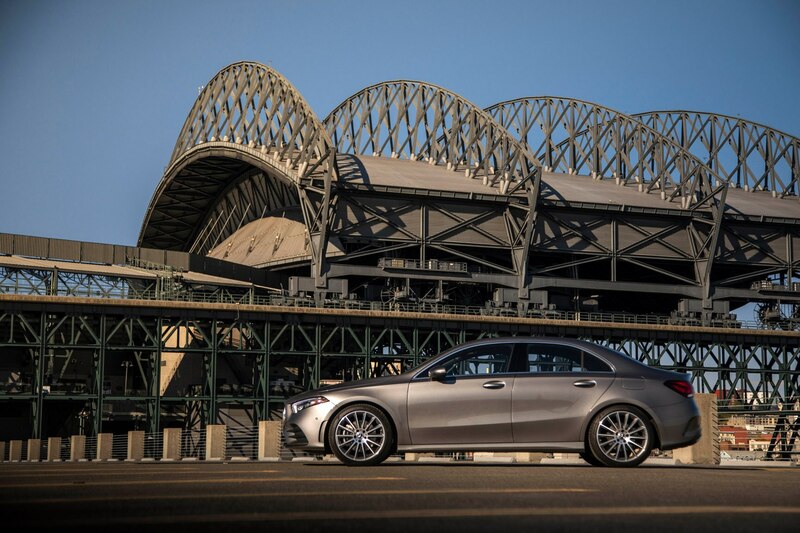 SEATTLE, Washington — Pity the poor sedan. 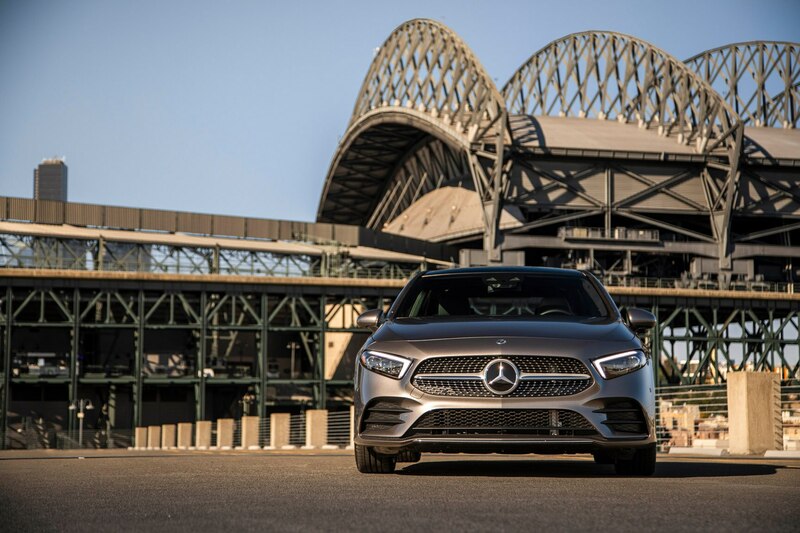 Cheap gas and shifting market demands mean that consumers who once loaded up the family four-door for that summer road trip are now packing crossovers and SUVs up to their panoramic sunroofs in people, gear, and pets. 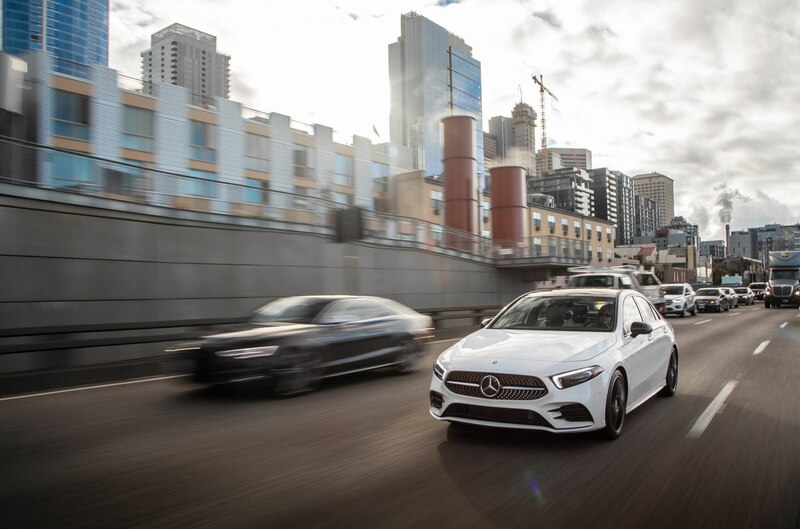 That’s bad news for automakers pushing smaller, lower three-box vehicles, so much so that Ford recently announced its decision to stop selling sedans altogether. 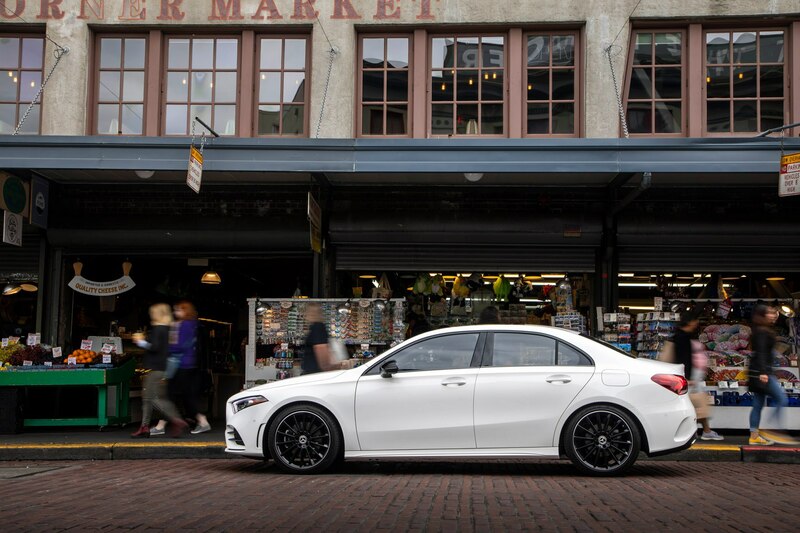 Other automakers may soon follow. 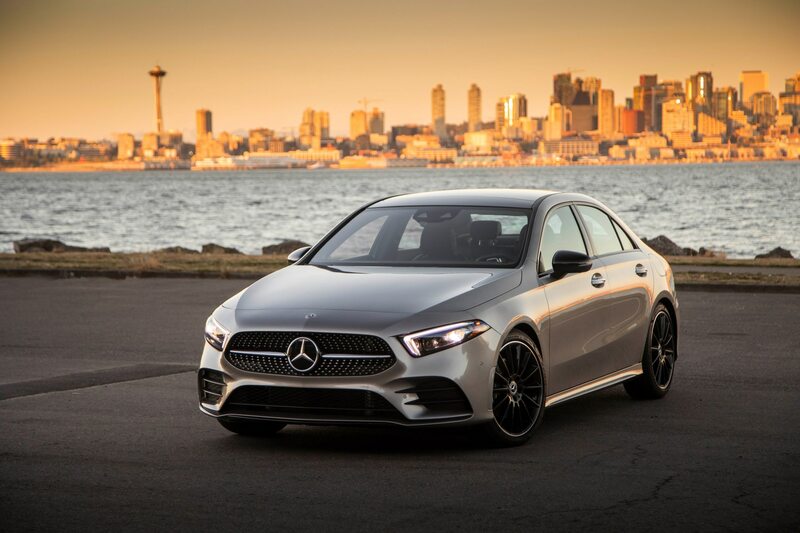 But not Mercedes-Benz, who is banking on the success of its new entry-level model in sedan form. 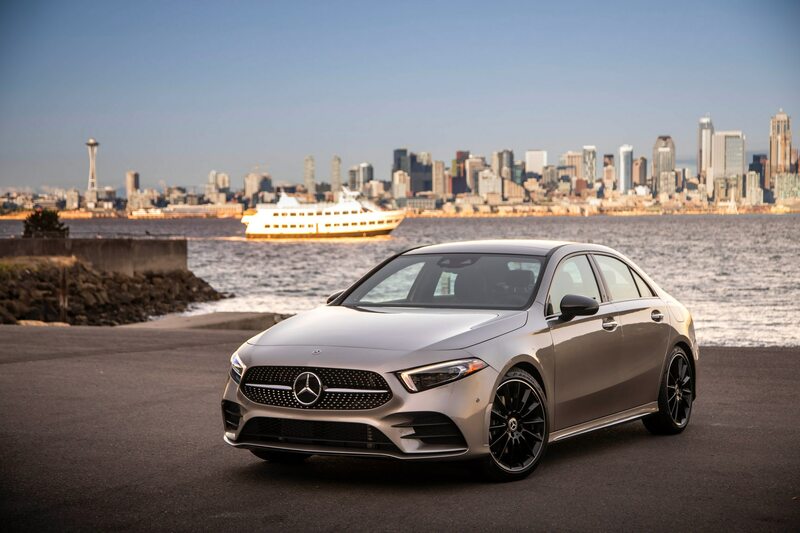 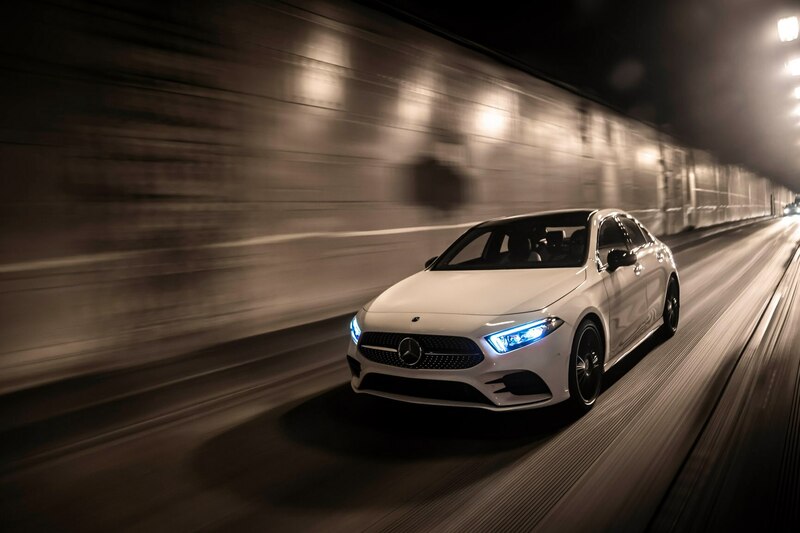 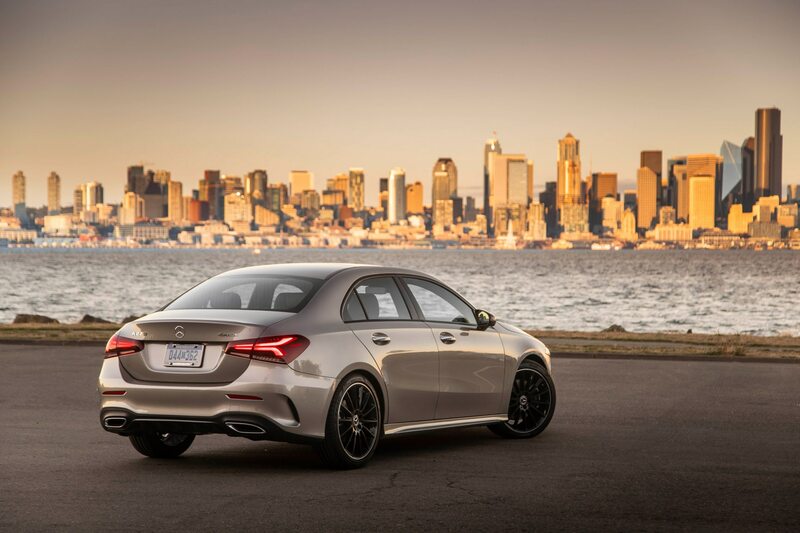 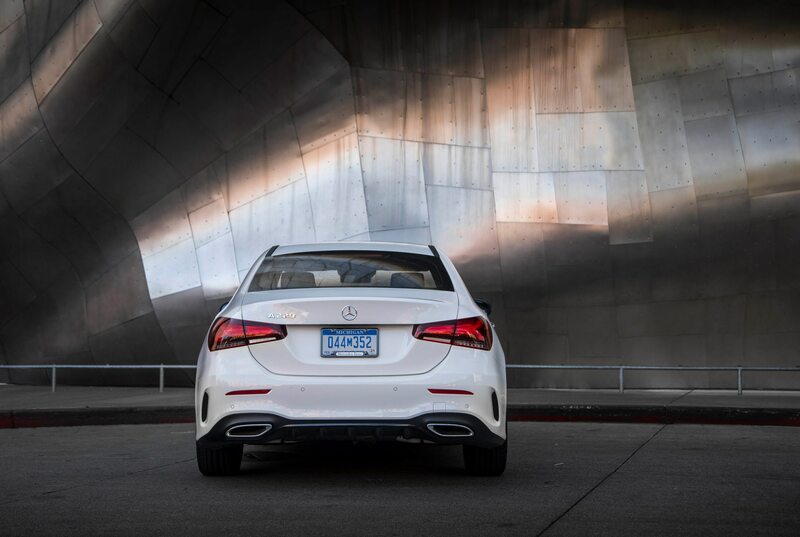 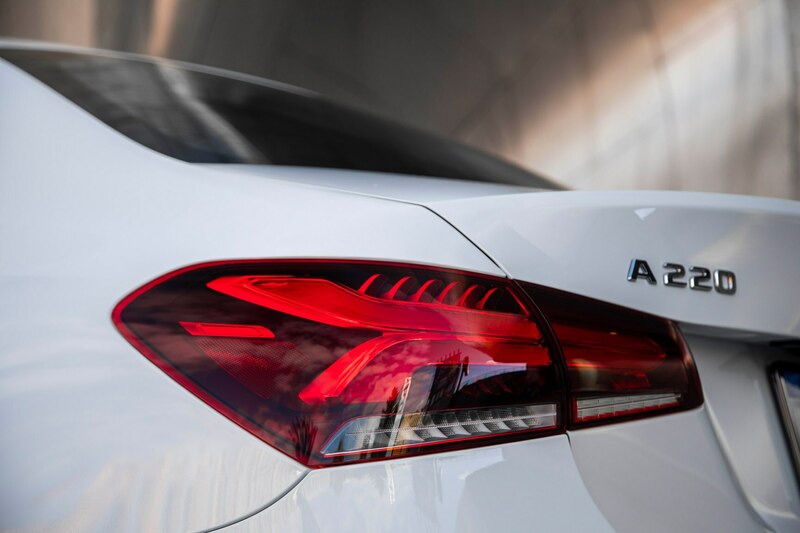 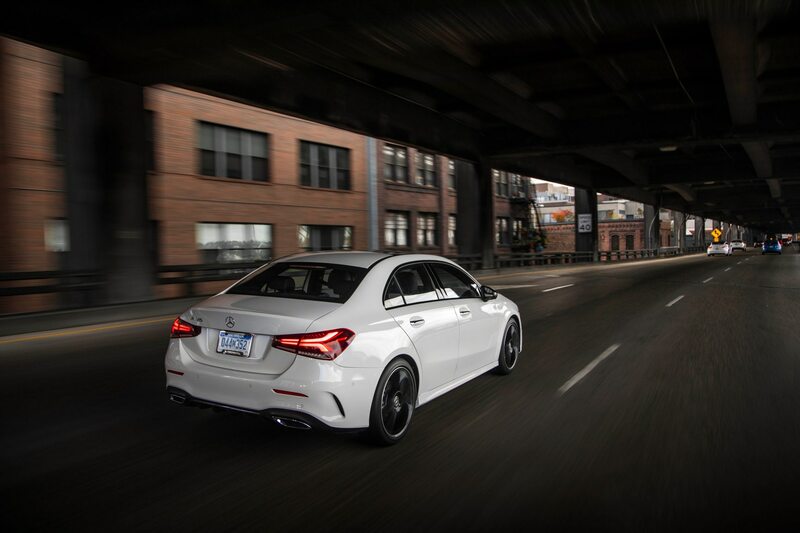 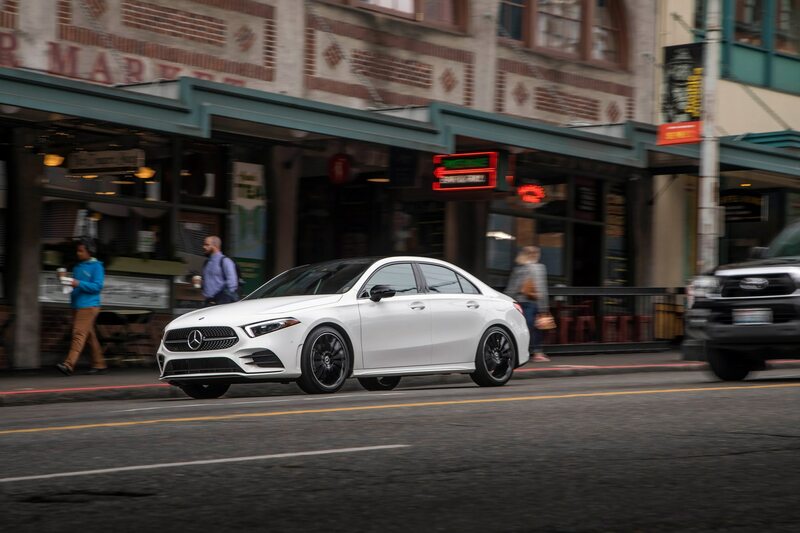 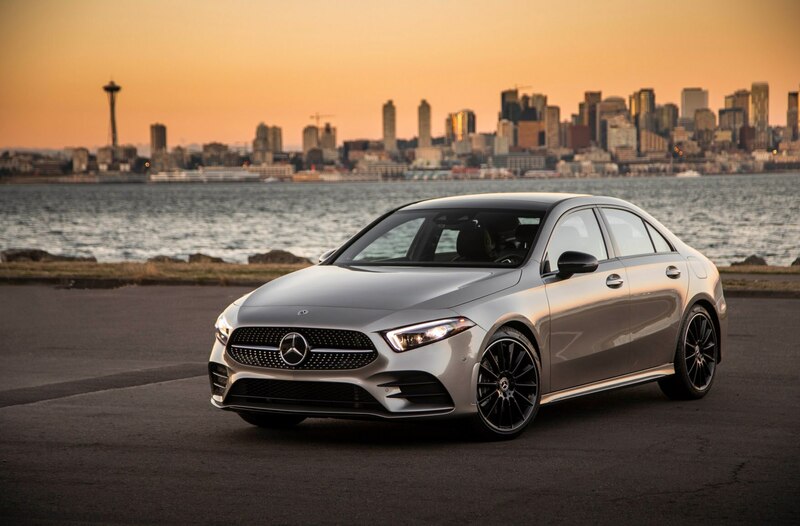 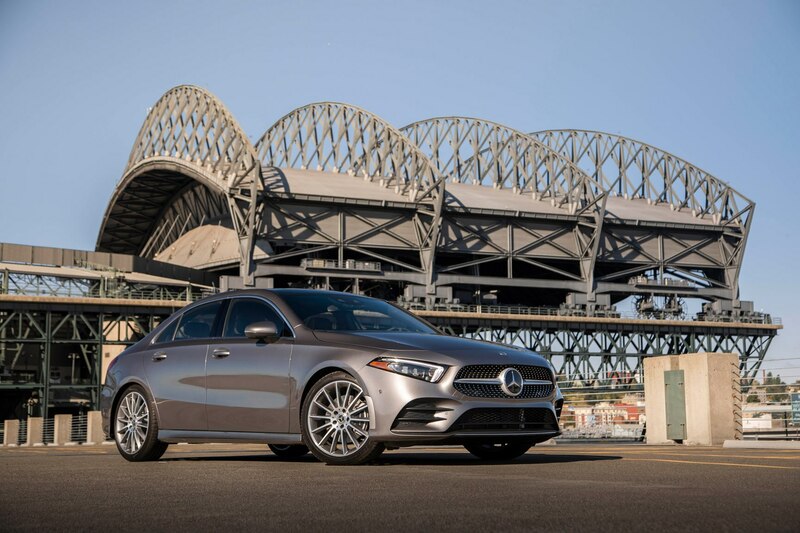 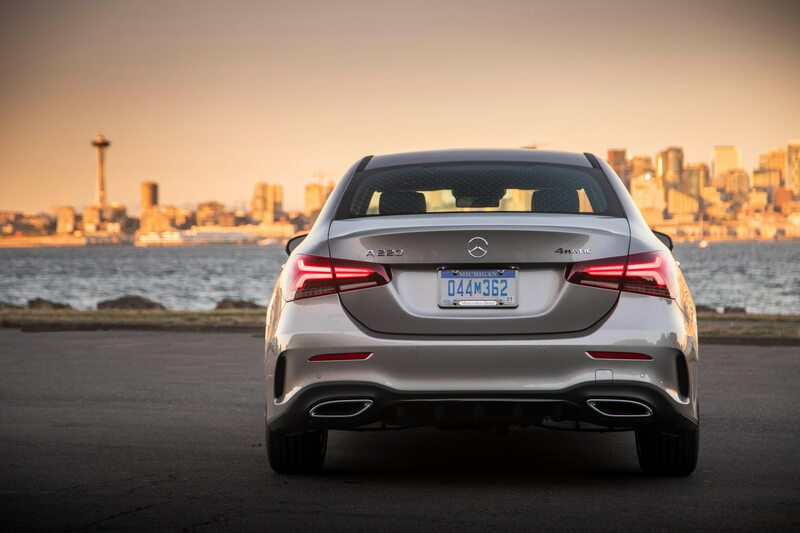 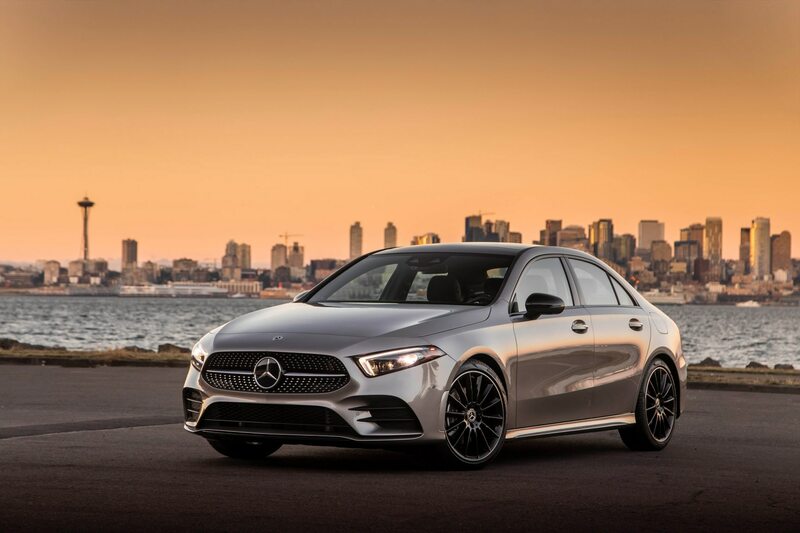 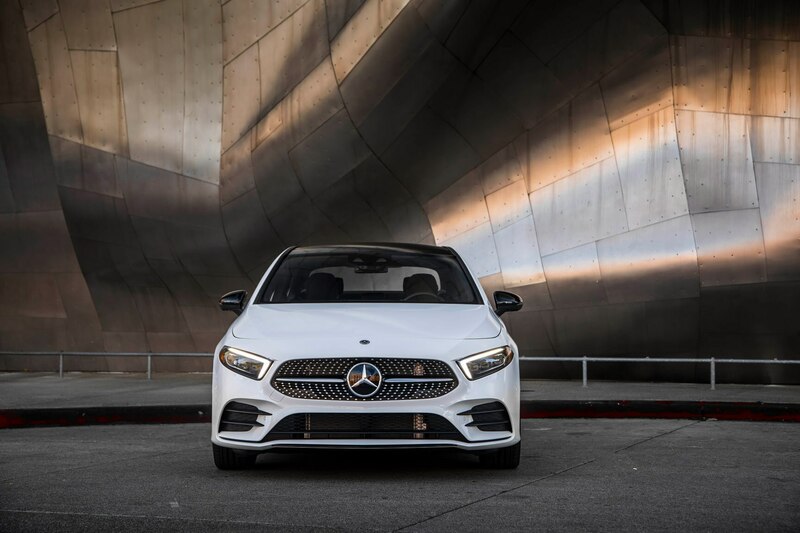 The new A-Class sedan will join the small CLA “four-door coupe” and GLA CUV in its U.S. showrooms starting early next year, completing a trio of sub-compact, premium vehicles targeted at bringing new young, mostly urban buyers into the Mercedes-Benz family from competing brands. 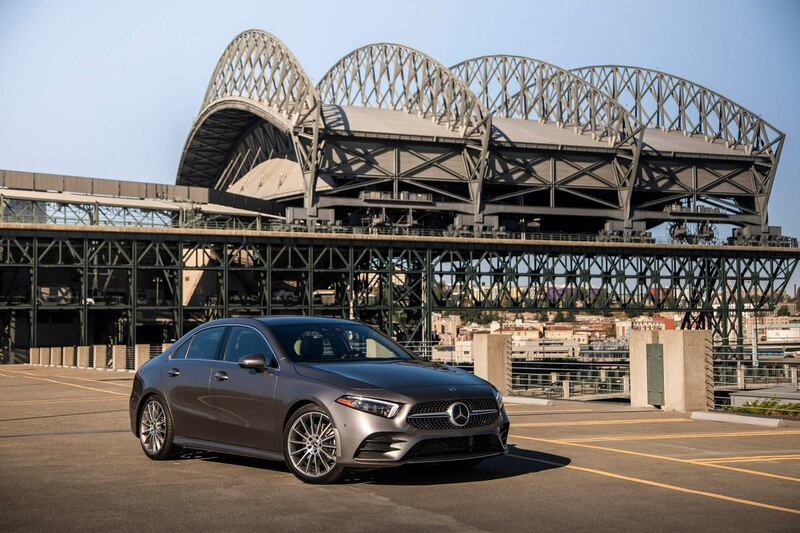 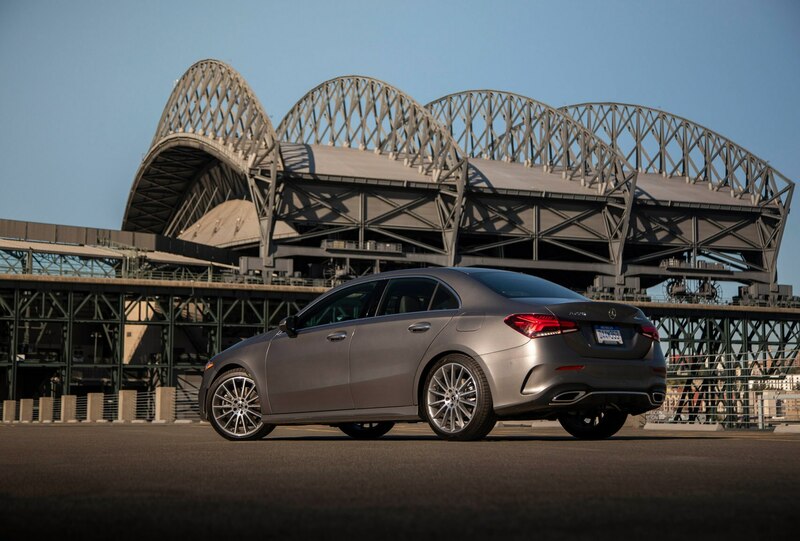 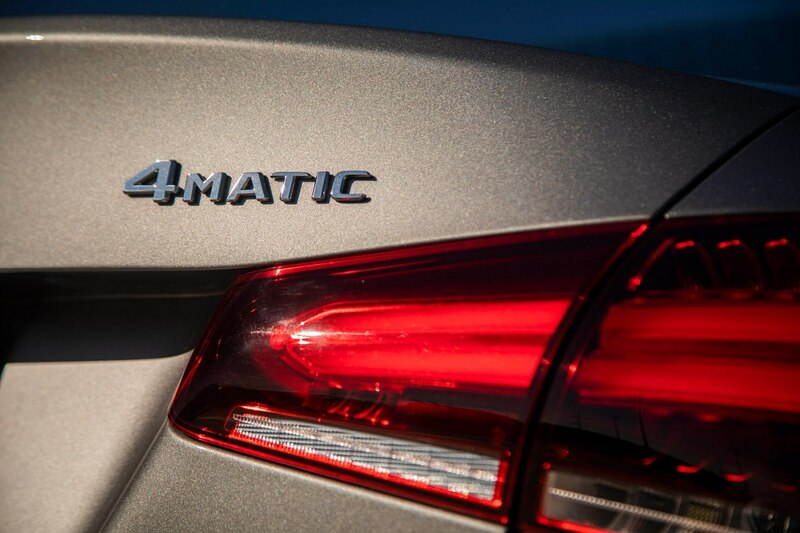 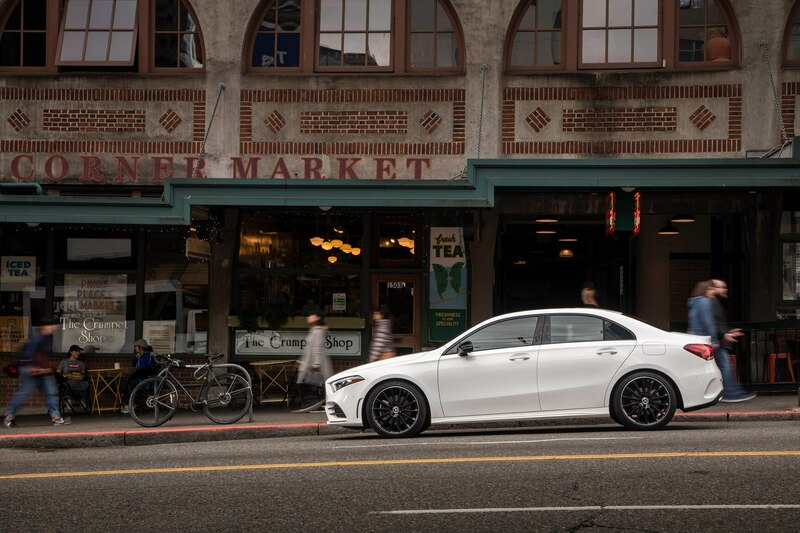 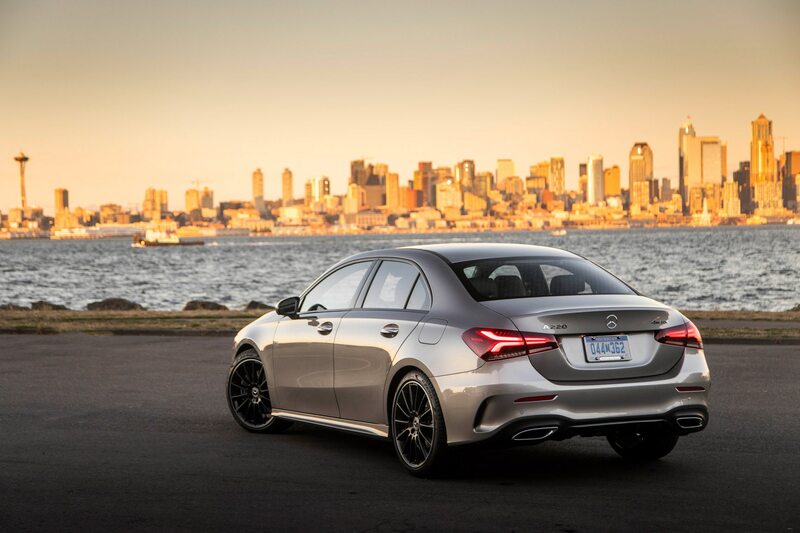 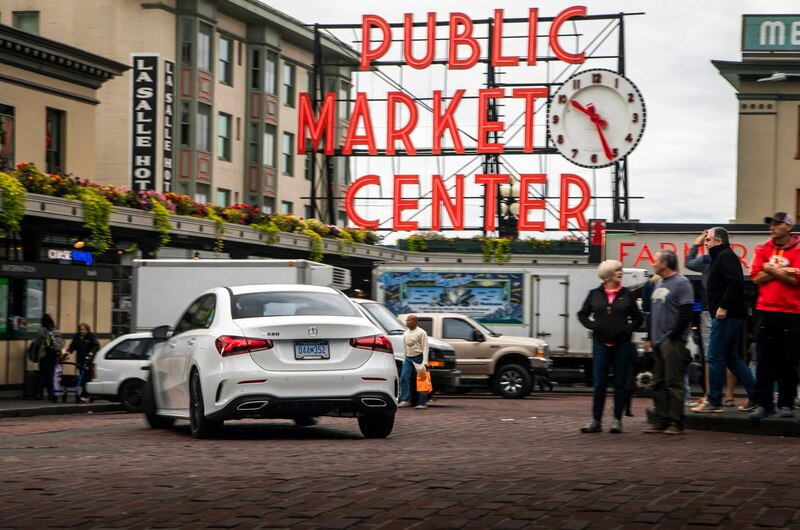 The CLA, launched in 2013 and the previous Mercedes entry point, did this in droves, with over 50 percent of its buyers being first-time Benz owners that the German brand hopes will move up into its larger, more expensive products when they outgrow the A-Class lineup. 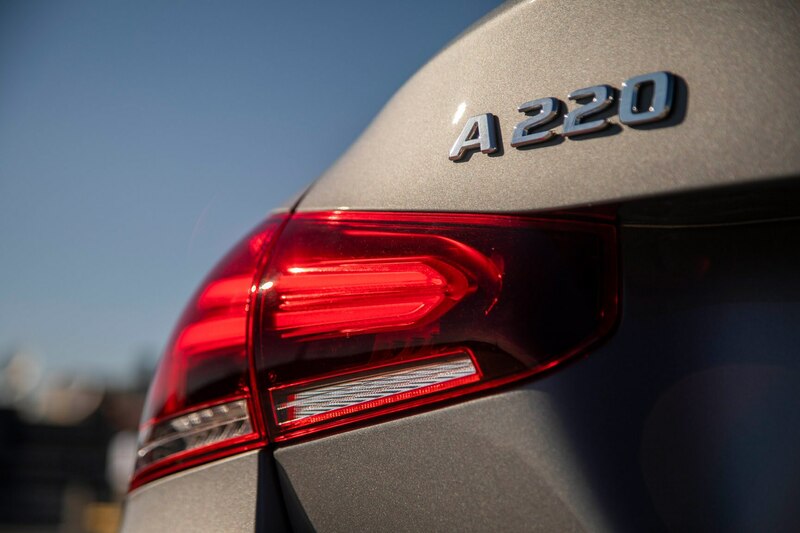 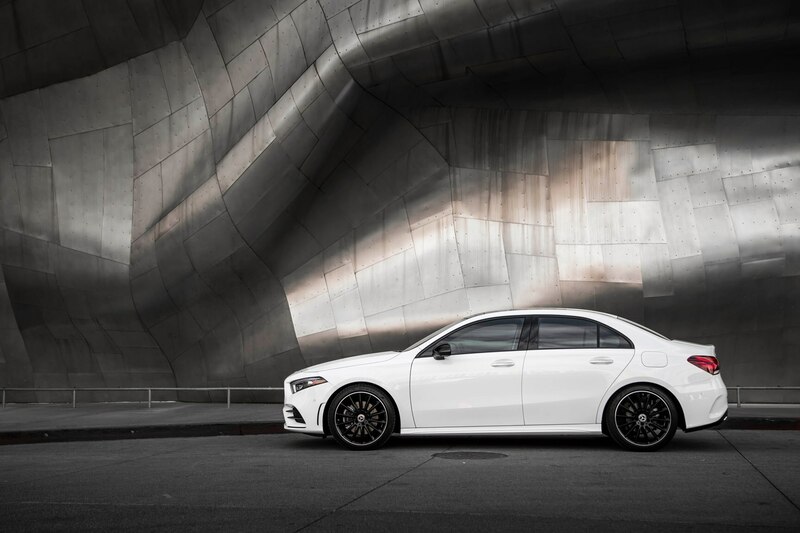 Riding on an all-new chassis with a short 107.4-inch wheelbase, the A220 is the U.S.’s first taste of a small traditional, three-box A-Class sedan. 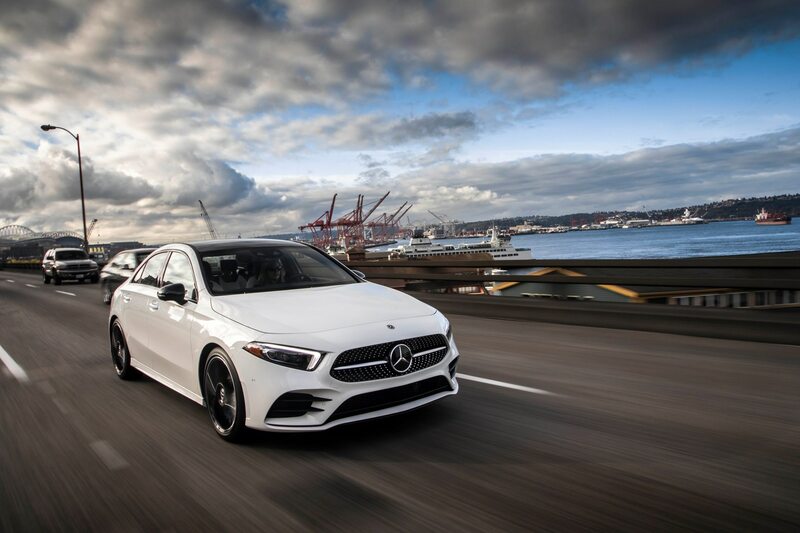 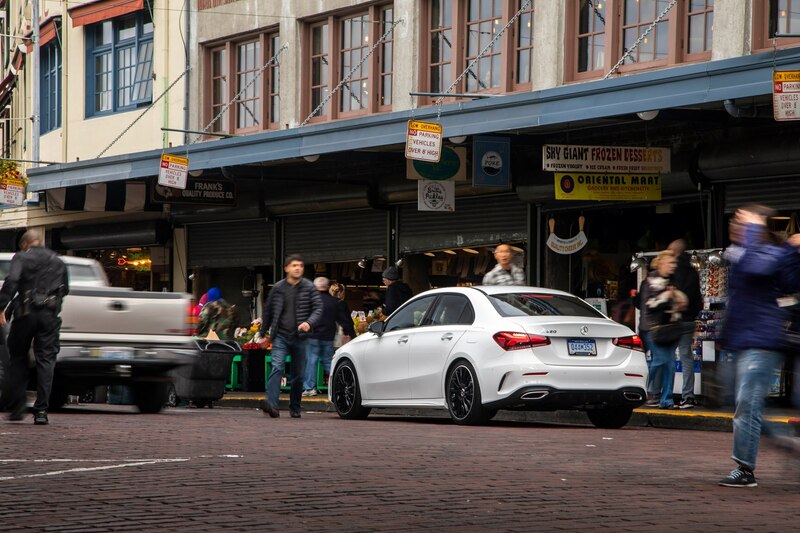 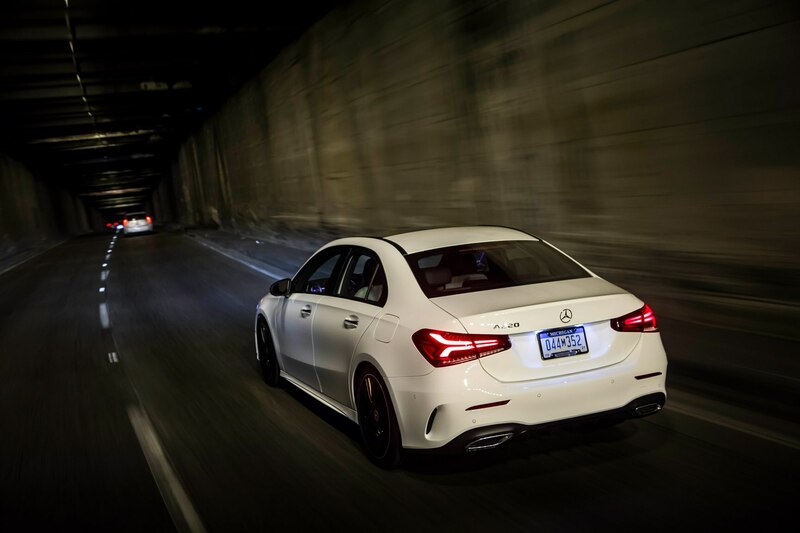 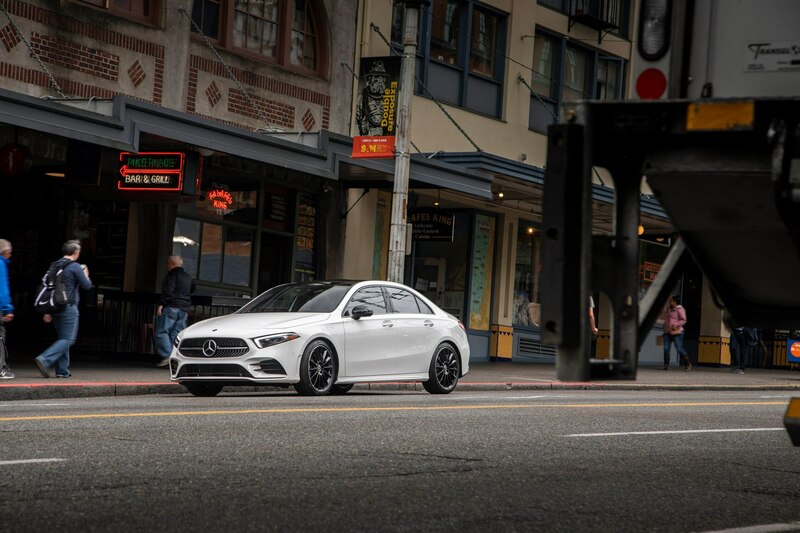 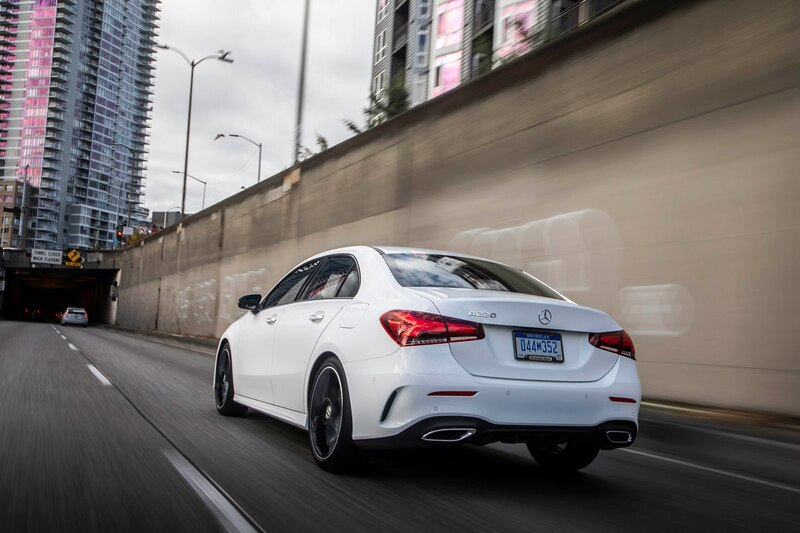 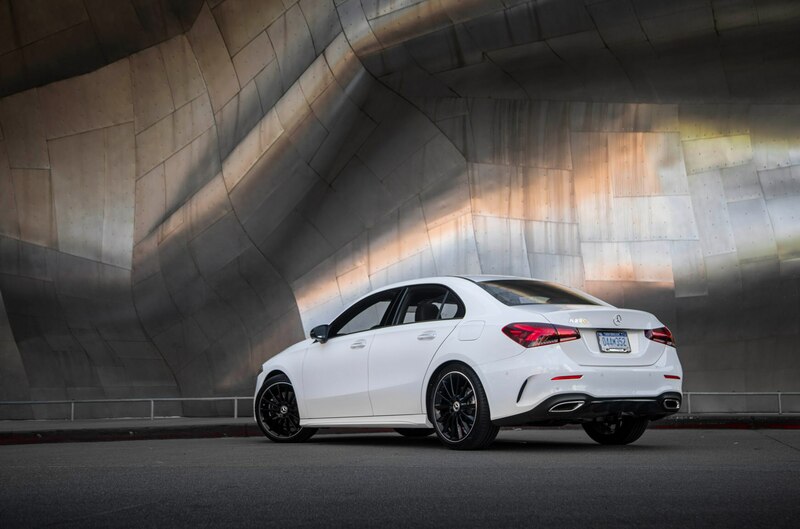 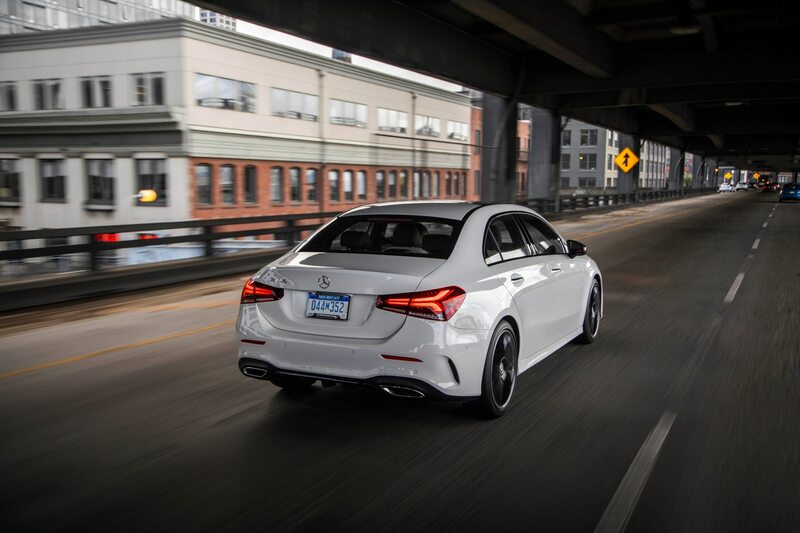 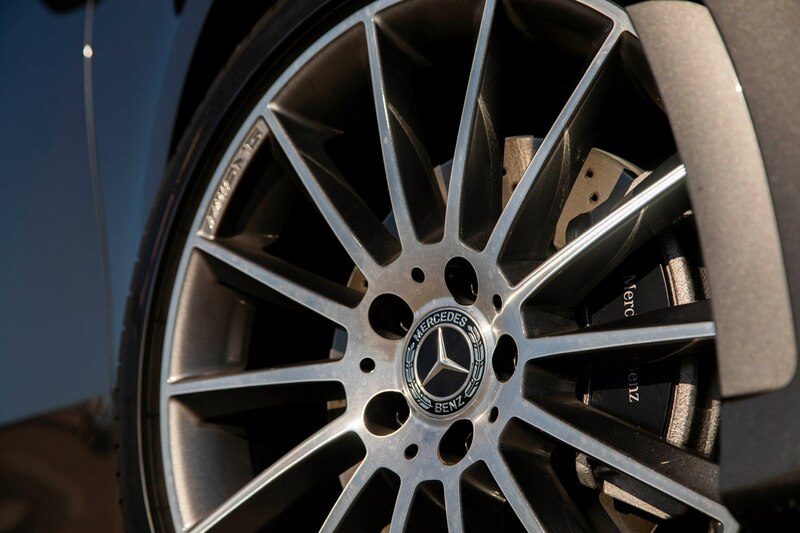 Equipped with MacPherson strut front suspension and a four-link rear suspension, the new chassis was optimized over the current CLA/GLA platform to provide improved noise, vibration, and harshness characteristics as well as more positive handling. 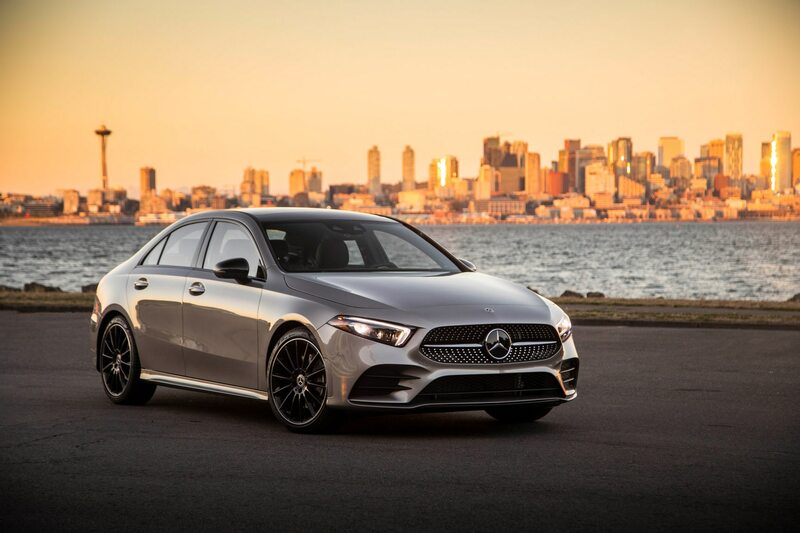 This same chassis will underpin the new CLA and GLA models when they launch in the coming years and it’s all but certain that the sedan’s new 2.0-liter, 188-hp, 221 lb-ft turbocharged four-cylinder engine will also be shared with its siblings as the base engine in the United States, paired to the brand’s 7G-DCT dual-clutch automatic gearbox. 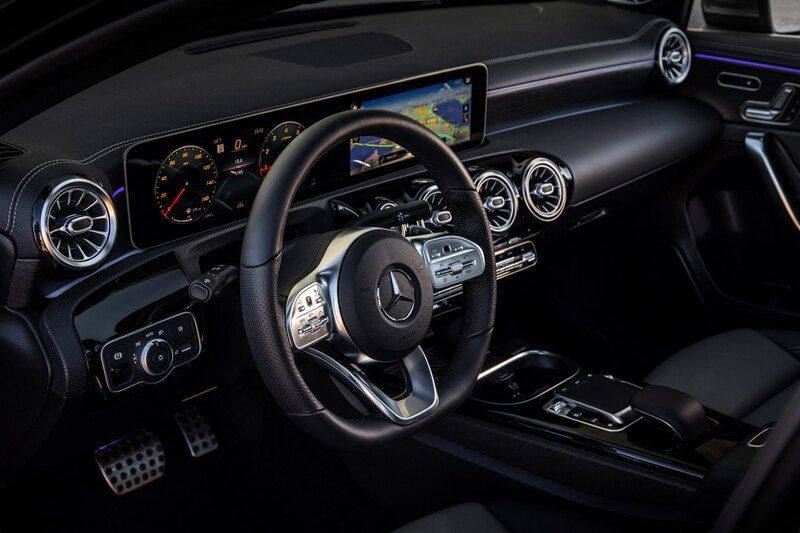 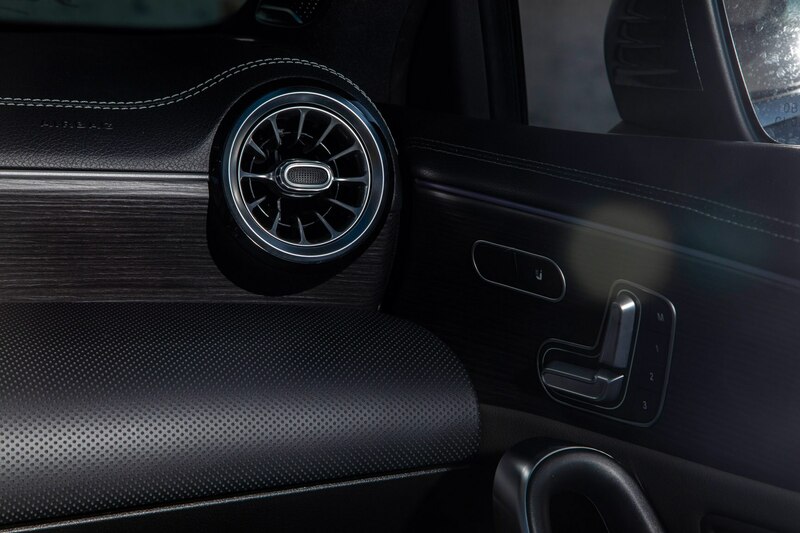 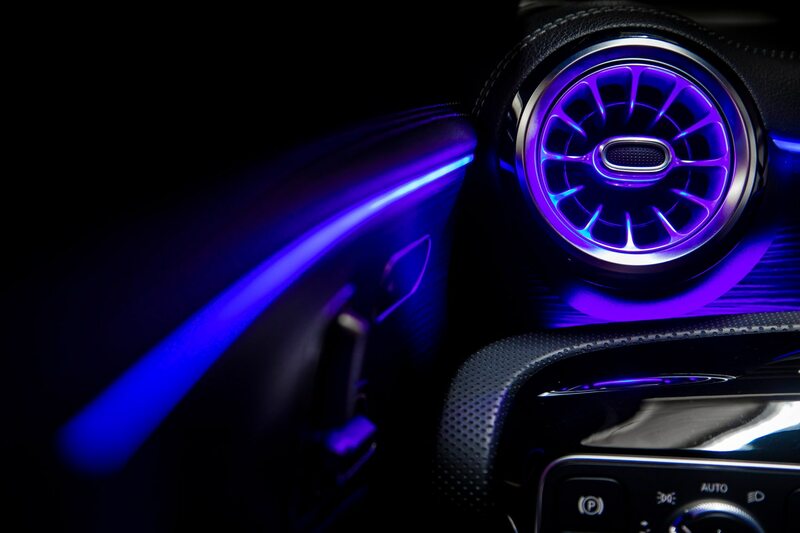 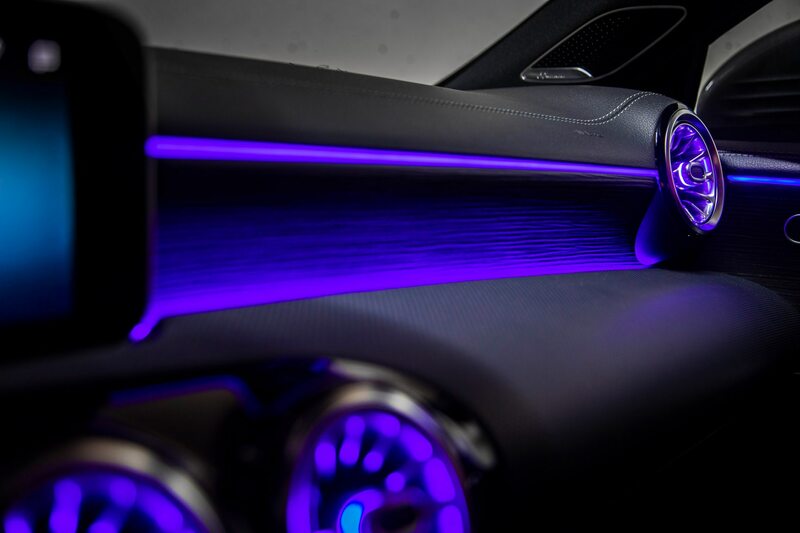 Inside, the A220 looks every bit the premium car Mercedes-Benz wants it to be, with turbine-styled climate control vents and a free-standing, fully-digital instrument panel and display that is similar in appearance to the E-Class sedan. 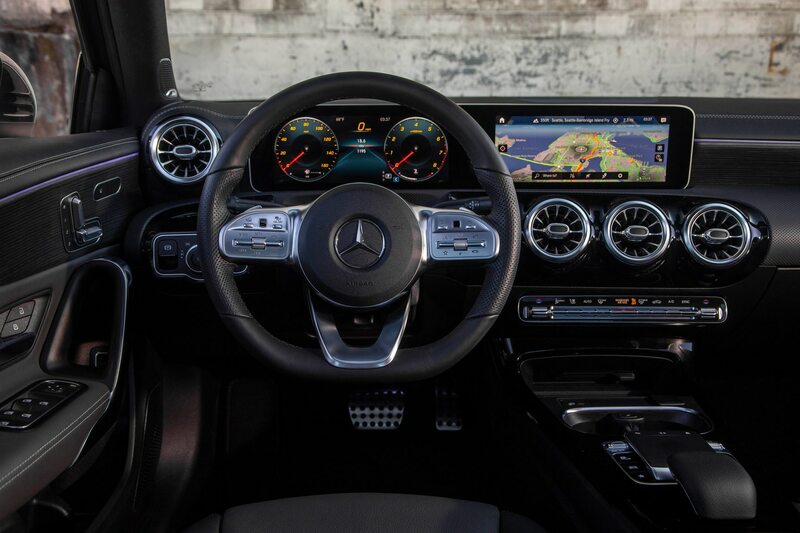 Both digital IP cluster and display are 7.0-inches in base configuration, or 10.25 inches if you select the $2,100 Premium Package, which also includes auto-dimming mirrors, Blind Spot Assist, and keyless start and entry among other features. 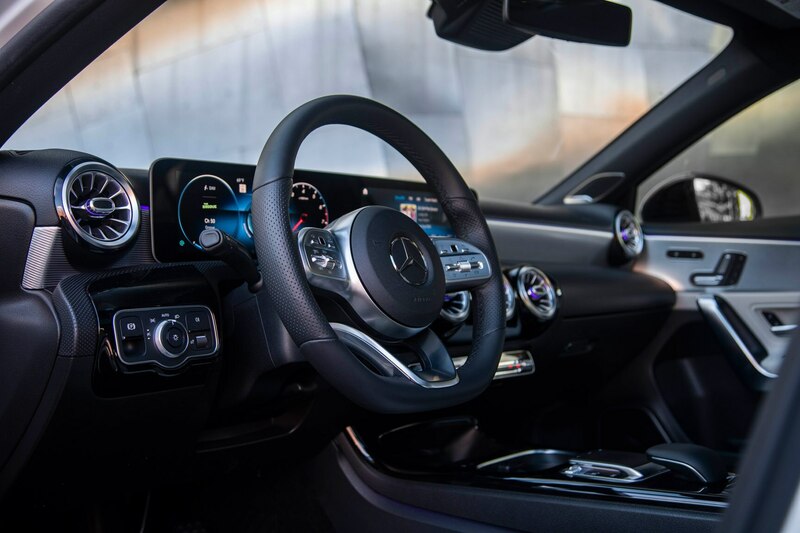 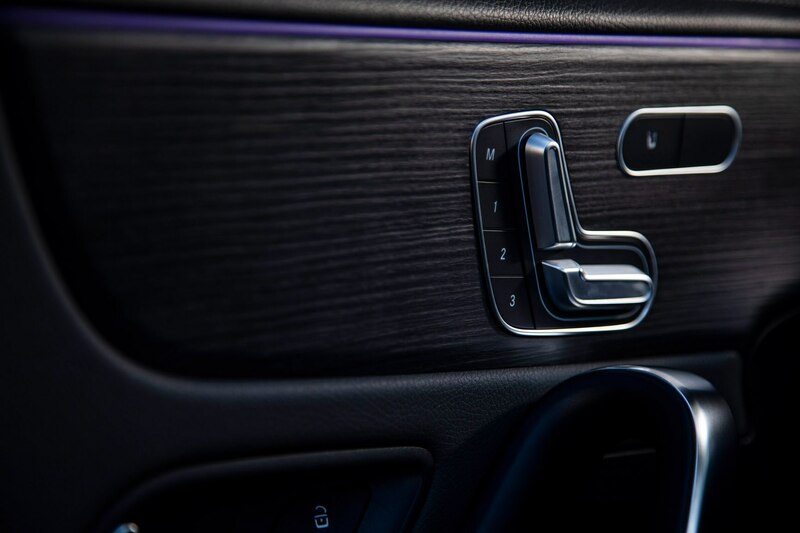 Center stack switchgear and gloss black trim looks every bit as swanky as on MB’s more upscale models and the perforated and grained soft-touch plastic dash materials are very nicely fashioned. 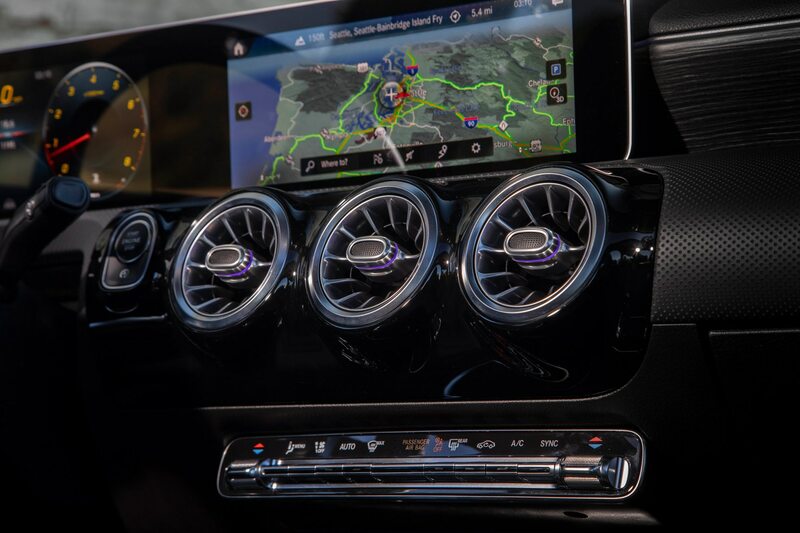 Bigger news is the implementation of the brand’s new MBUX infotainment system, which makes its debut on the A-Class sedan and will go on to replace the current COMAND setup across the full line-up (next up to receive MBUX is the 2019 GLE, we’re told). 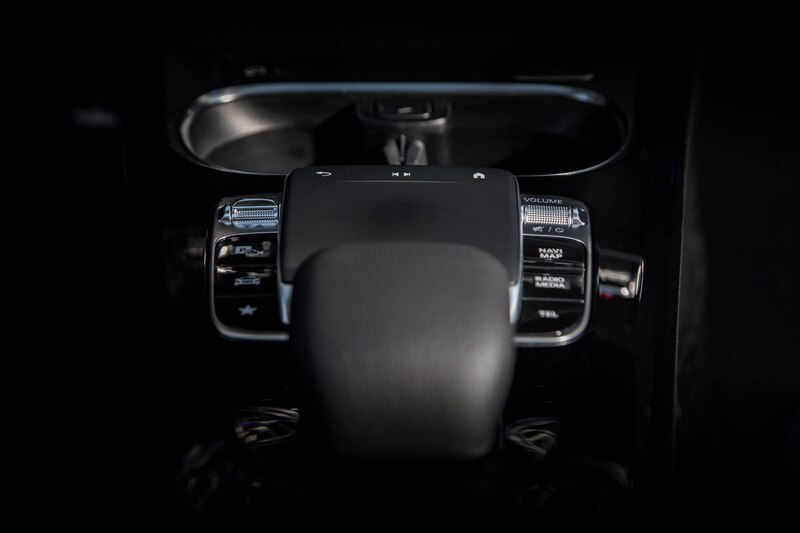 The MBUX system does away with the old center-console mounted rotary controller in favor of a touchpad in its place and a touchscreen display on the center stack. 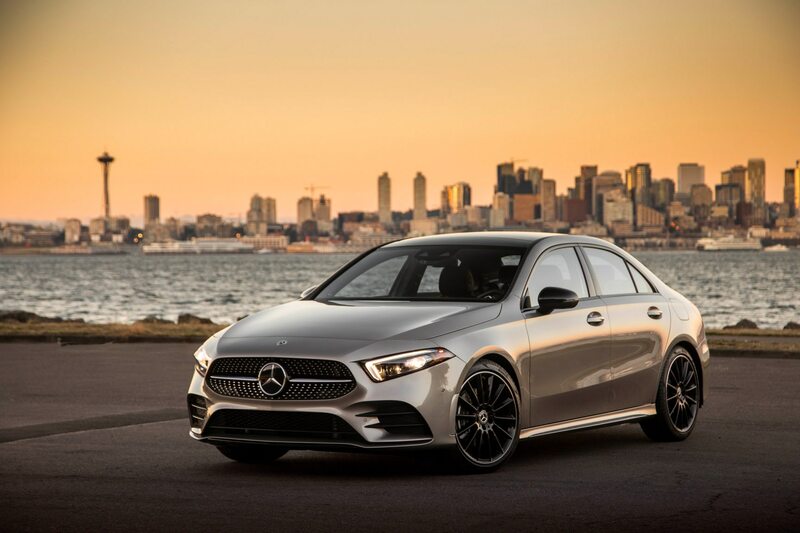 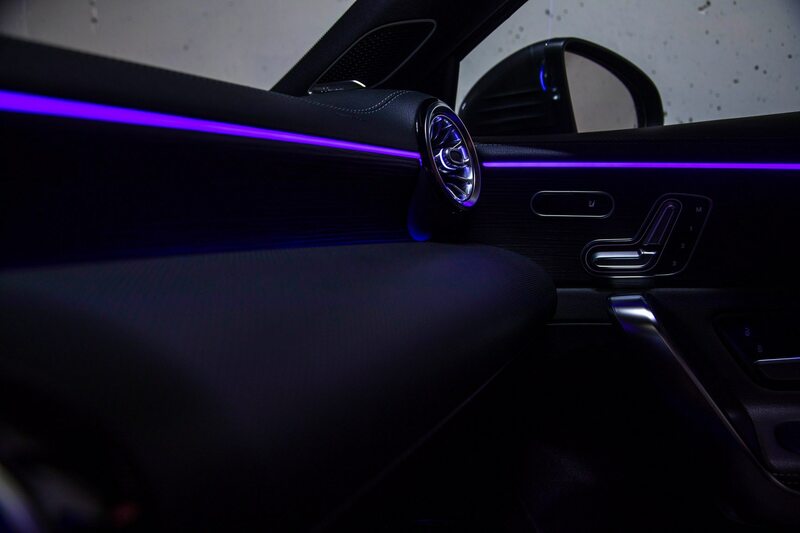 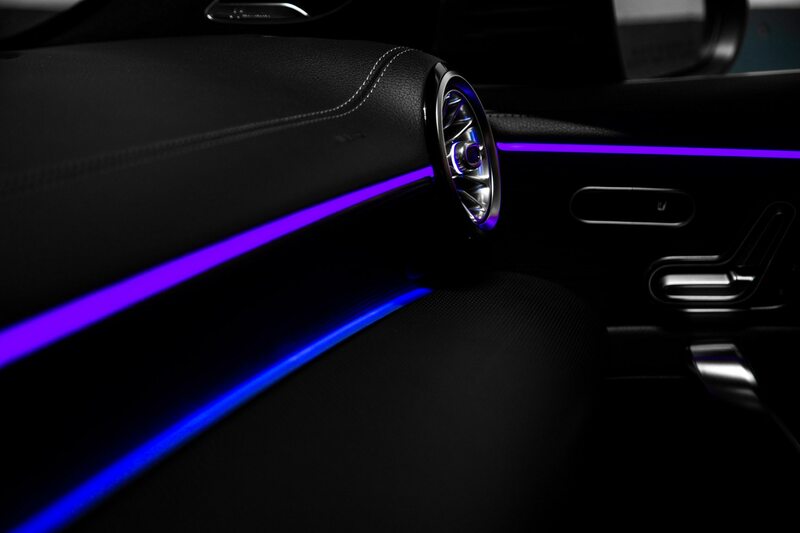 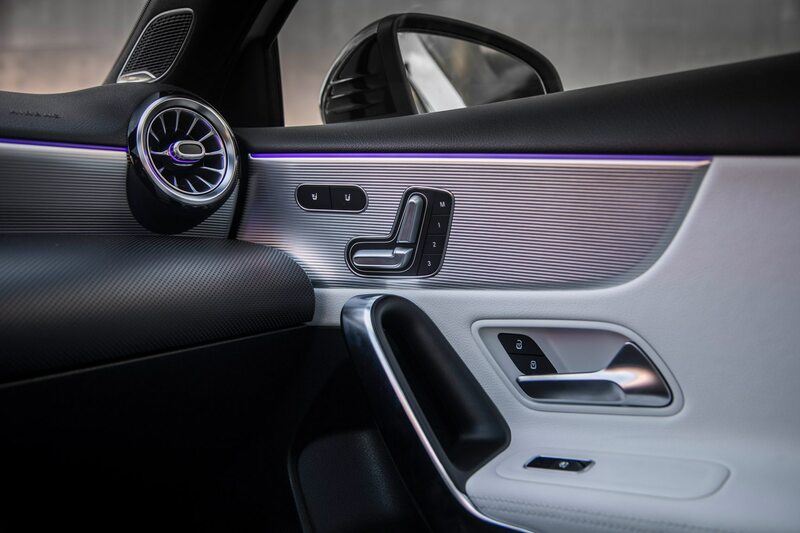 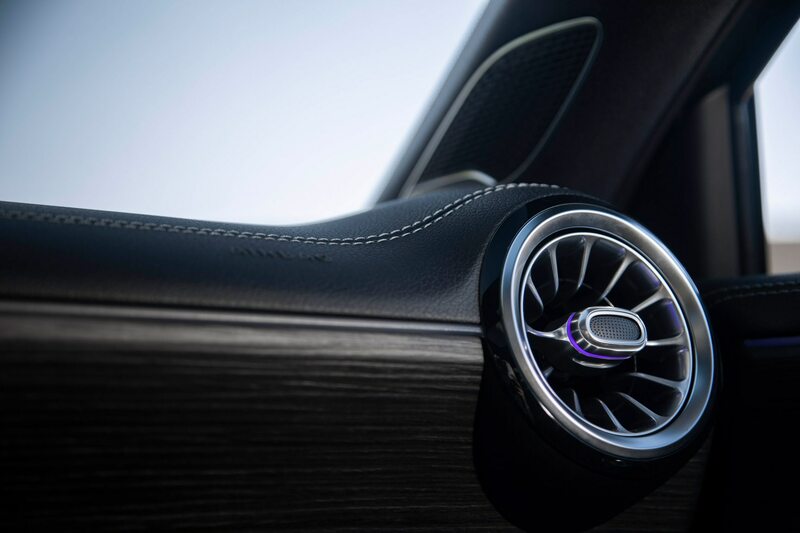 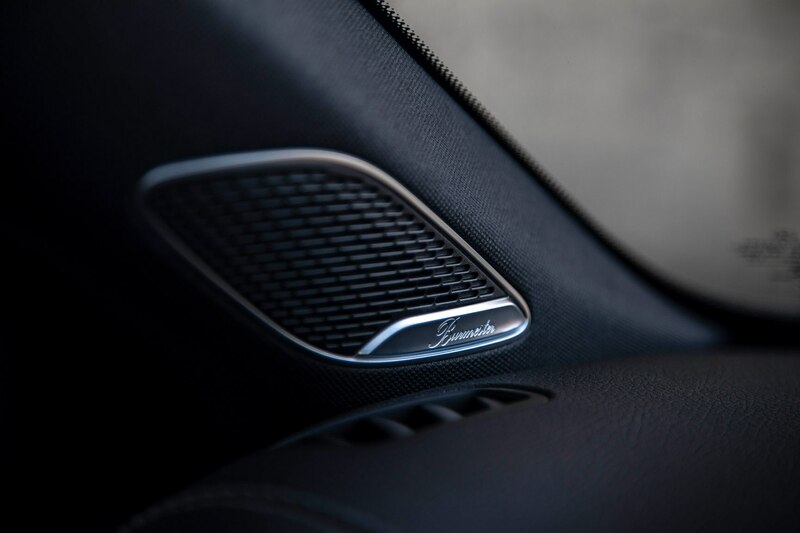 That said, Mercedes is expecting that MBUX’s new voice command interface will ultimately be what most A-Class sedan owners use to input their demands. 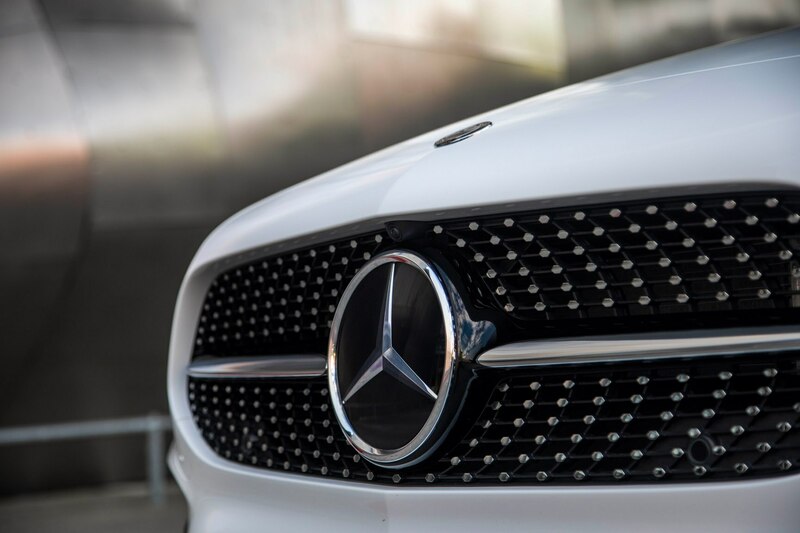 Similar to other “smart” tech products, users call up the voice command system by saying “Hey, Mercedes…” and then giving a command in plain, conversational speech. 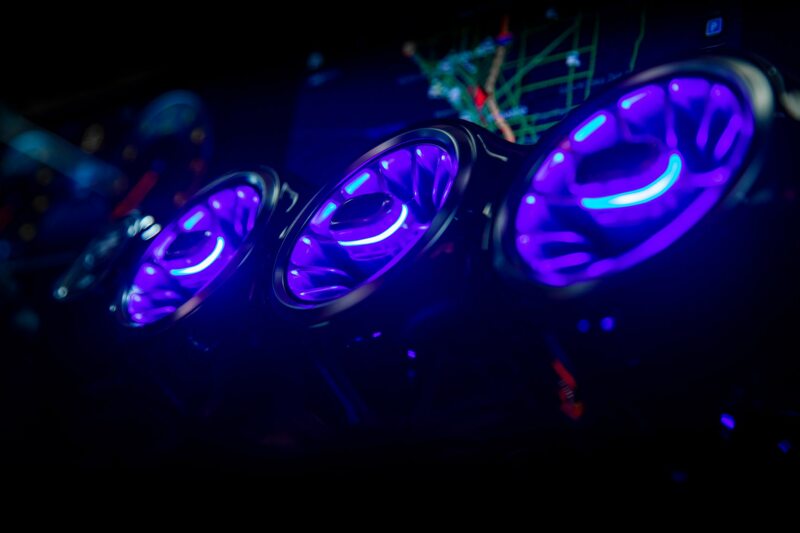 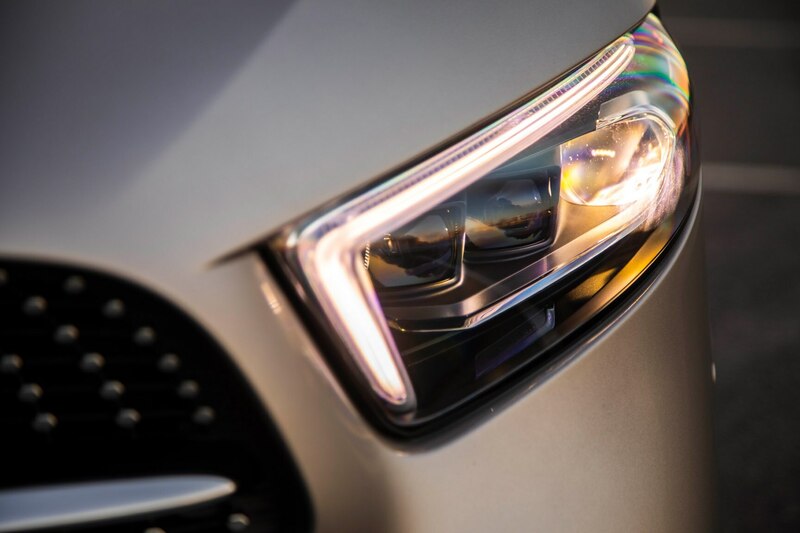 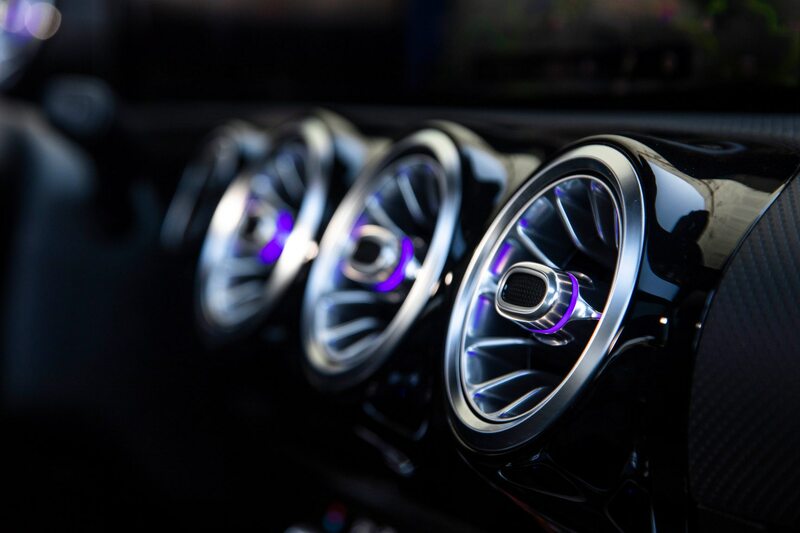 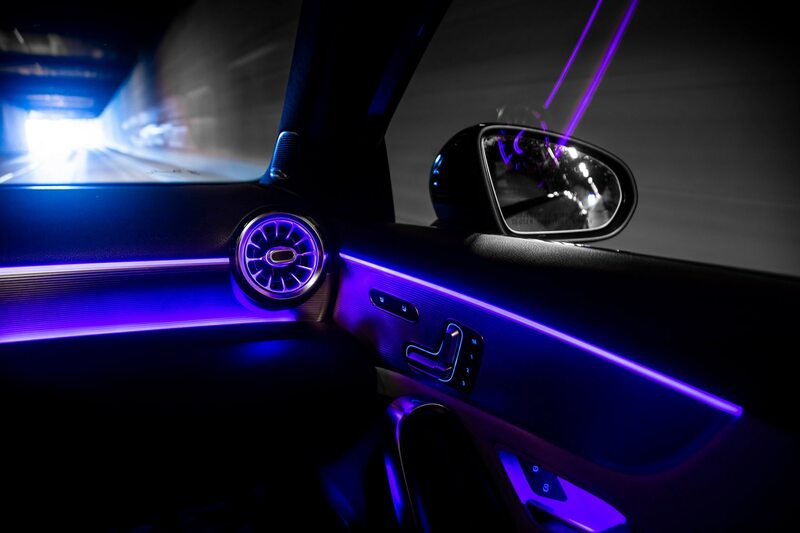 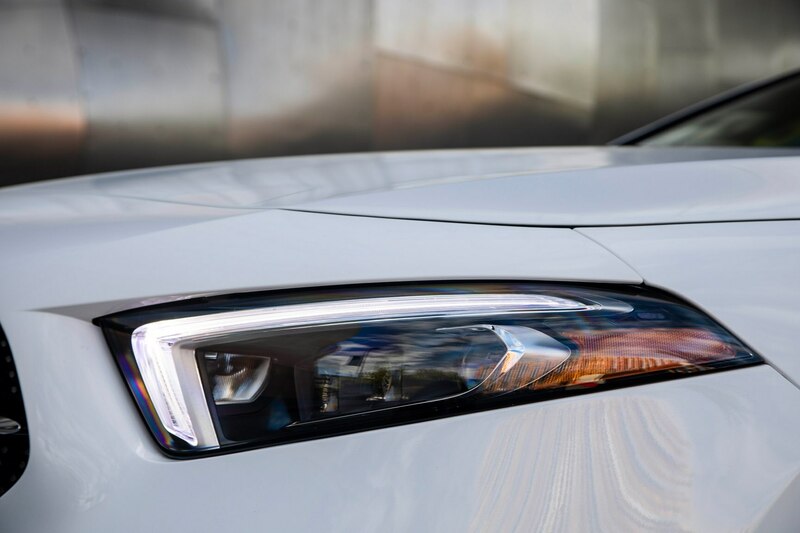 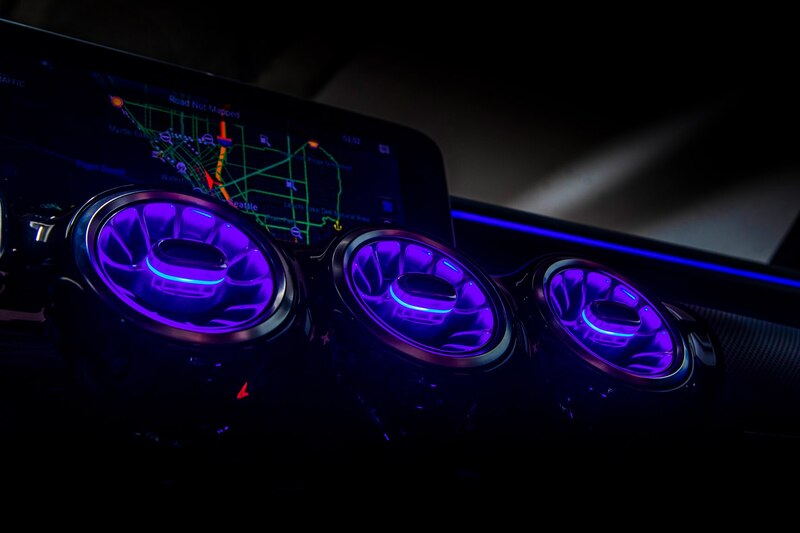 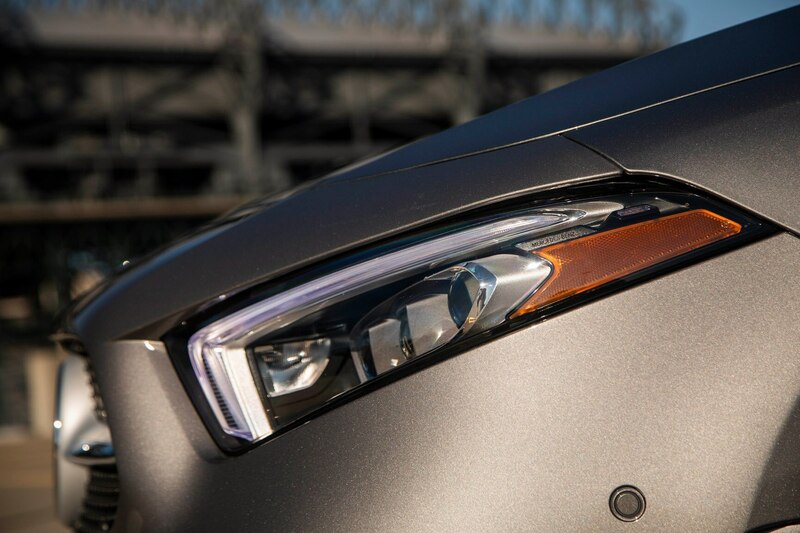 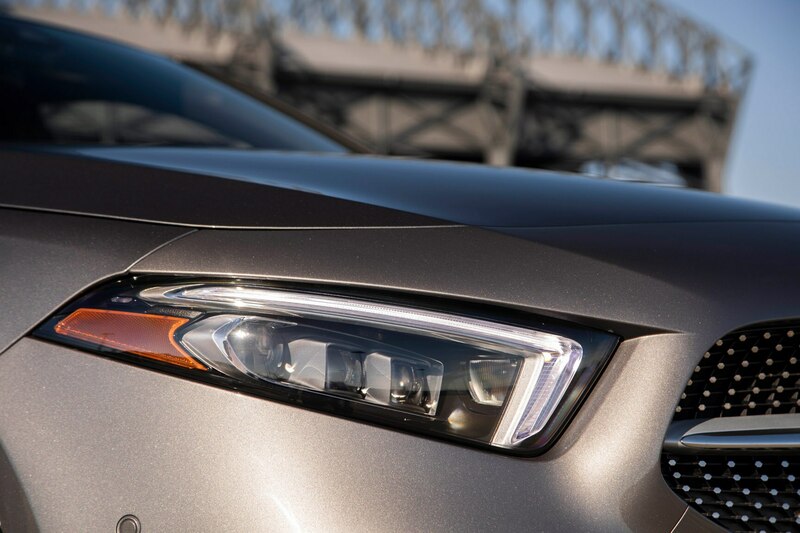 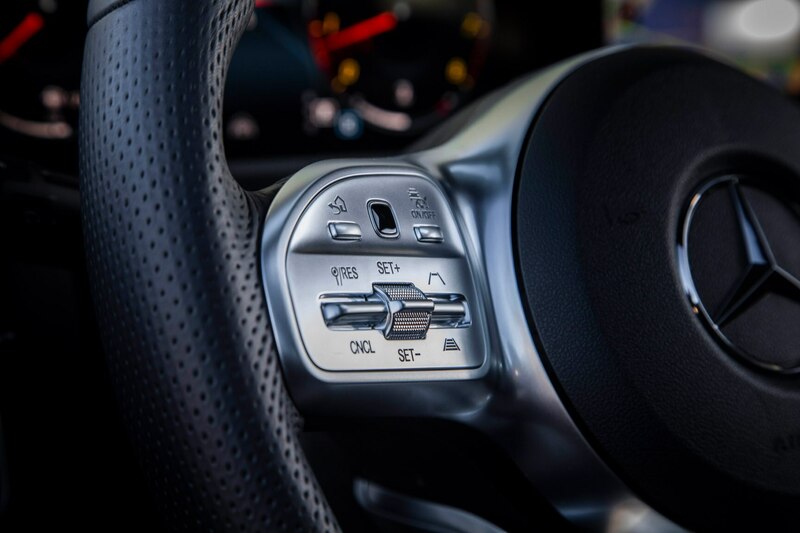 Brand engineers say the artificial intelligence-enabled system is designed to understand more complex commands than your typical automotive interface. 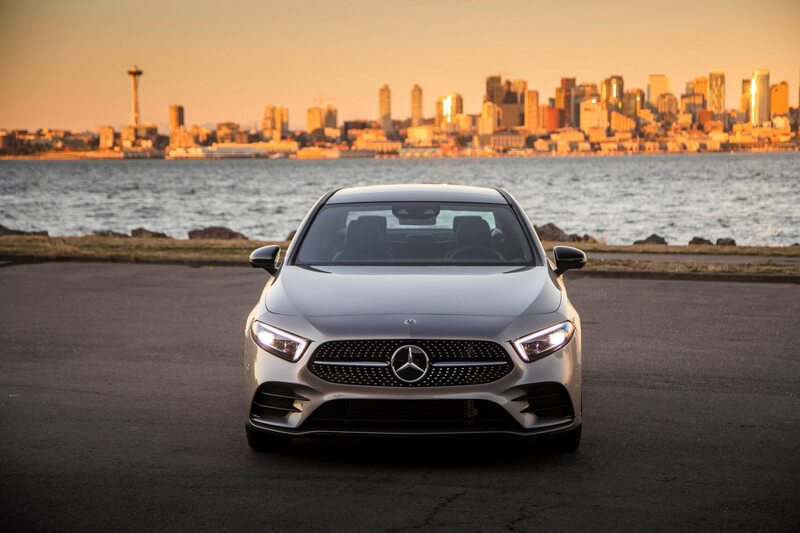 “Hey Mercedes, what is the meaning of life?” yields a thorough and thoughtful response from MBUX’s robo-woman voice and asking “Hey Mercedes, find an Italian restaurant in Seattle with at least four stars that is open at 9:00 pm,” as you might ask your iPhone’s resident personal assistant, Siri, is a viable request. 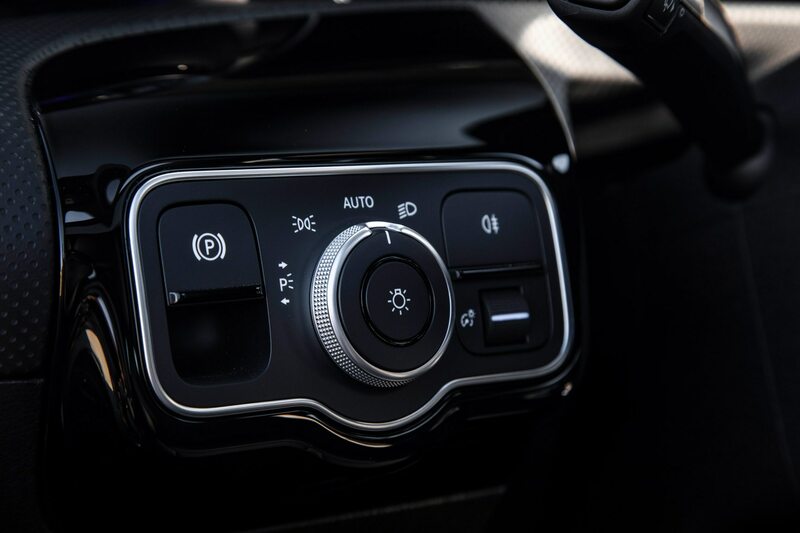 What MBUX can’t change by voice is vehicle drive settings, such as ESC or active safety features, as a function of safety. 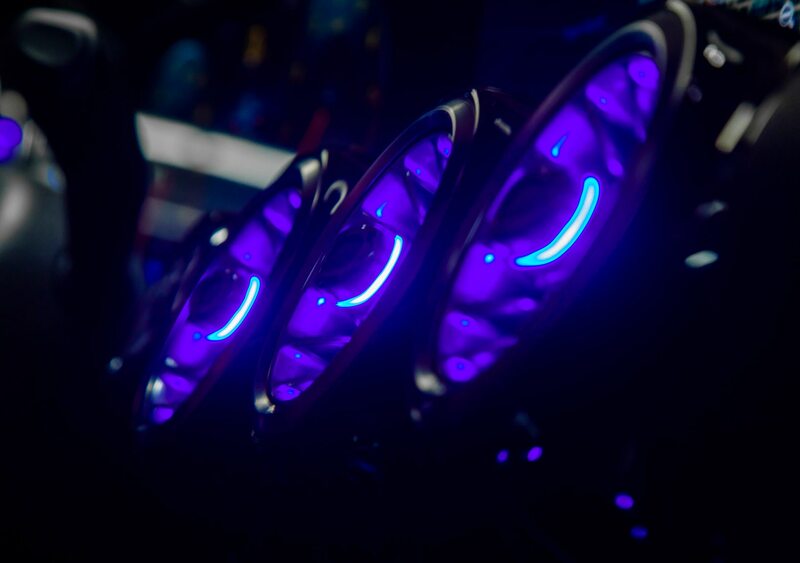 We found the system to work reasonably well in practice, though we’d like to spend a week with MBUX so that it better “learns” our voice and speech patterns before arriving at a final conclusion. 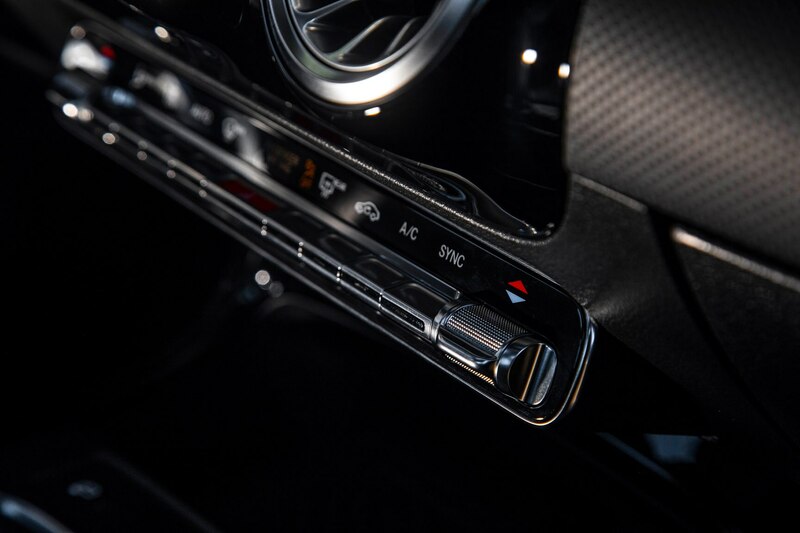 That said, you quickly learn that while you could task MBUX with simple commands such as turning down the radio volume or turning up the climate control temperature, it’s often faster and easier to just do such menial tasks yourself and save the more complex stuff for the computer. 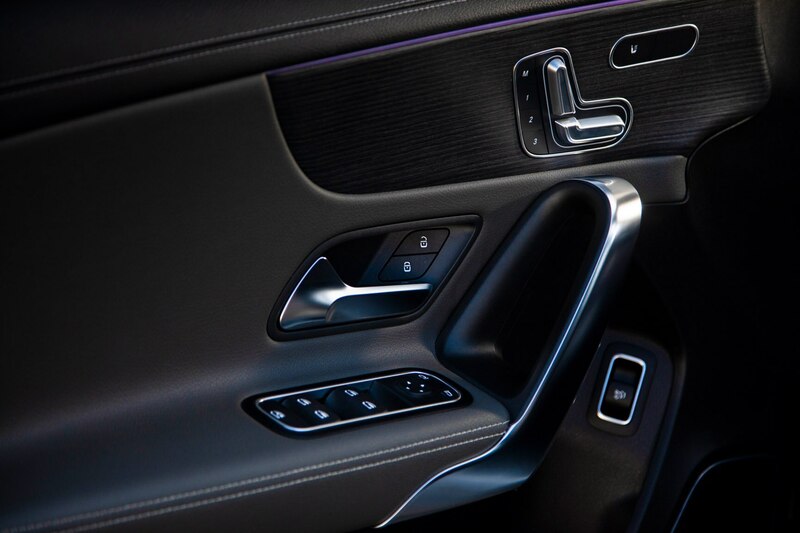 Other advanced system features include some nifty navigation tricks. 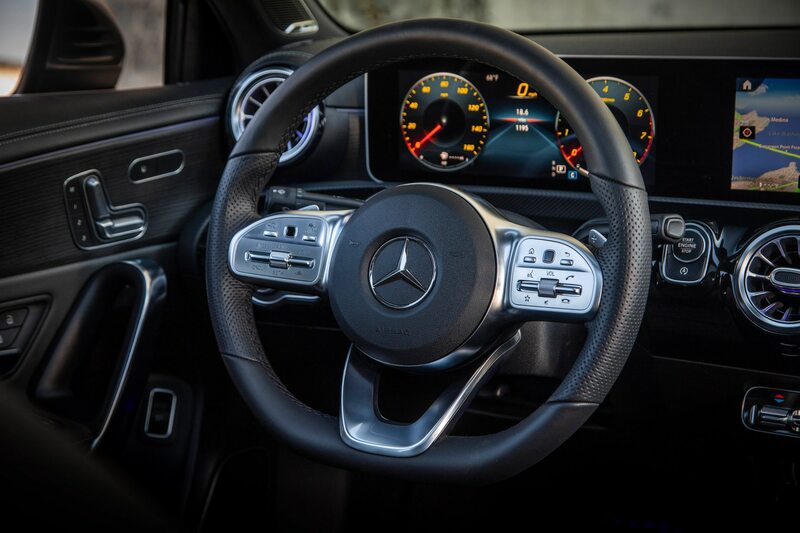 For example, using the front-mounted camera to project an image of the road ahead on the center display, MBUX can superimpose a turn arrow as you approach the street it asks you to turn on, helping to clarify exactly where the navigation system is directing you. 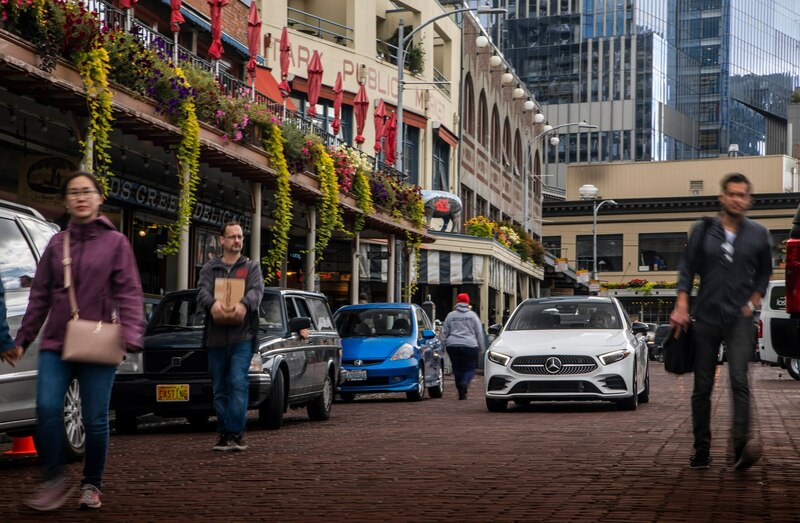 It can also superimpose building addresses on each side of the street as you approach them and the names of cross streets. 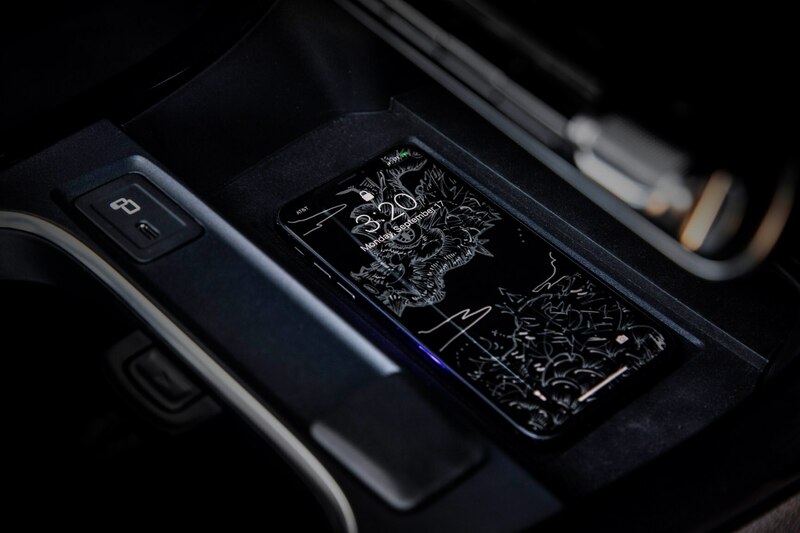 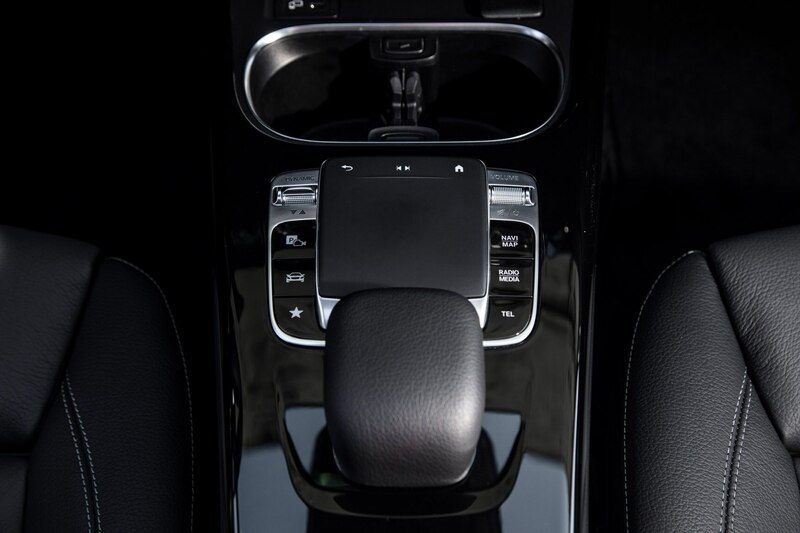 This is technology that is more than just flashy, it’s also extremely useful and is clearly the way forward for manufacturer-integrated navigation systems and possibly future versions of Apple CarPlay and Android Auto. 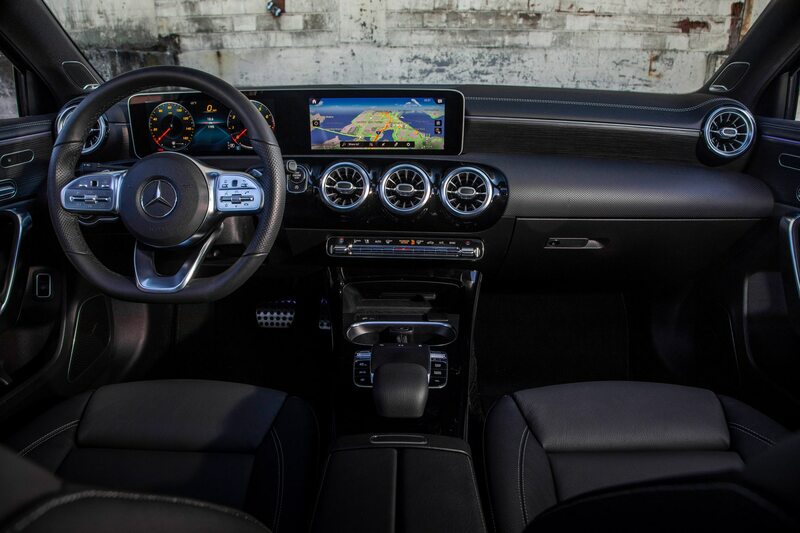 We were also impressed with the 10.25-inch system’s sharp resolution and its tablet-like functionality, with swipe and multi-touch gestures available. 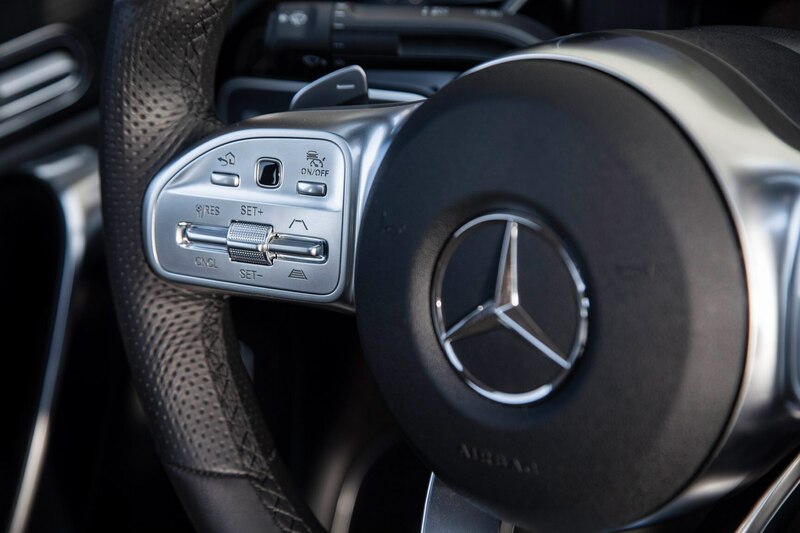 The steering wheel controls were also useful, with tiny pads for swipe functionality and individual controls for instrument panel and center displays on the left and right wheel spokes, respectively. 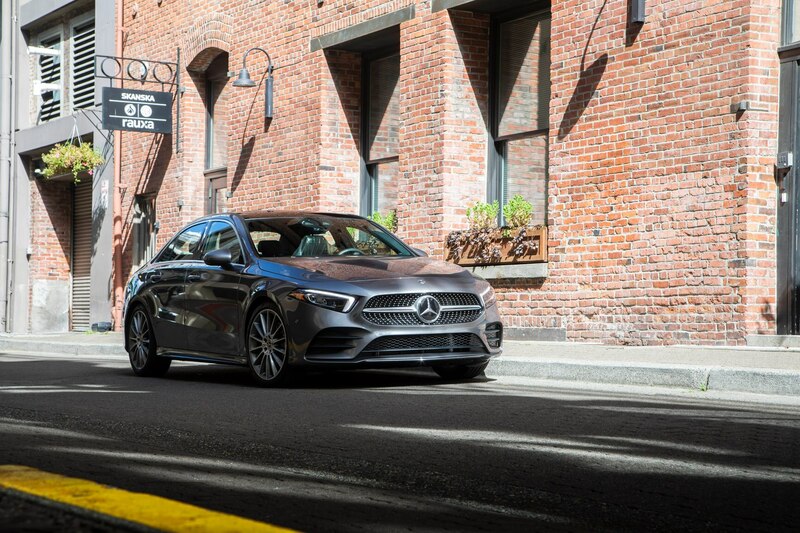 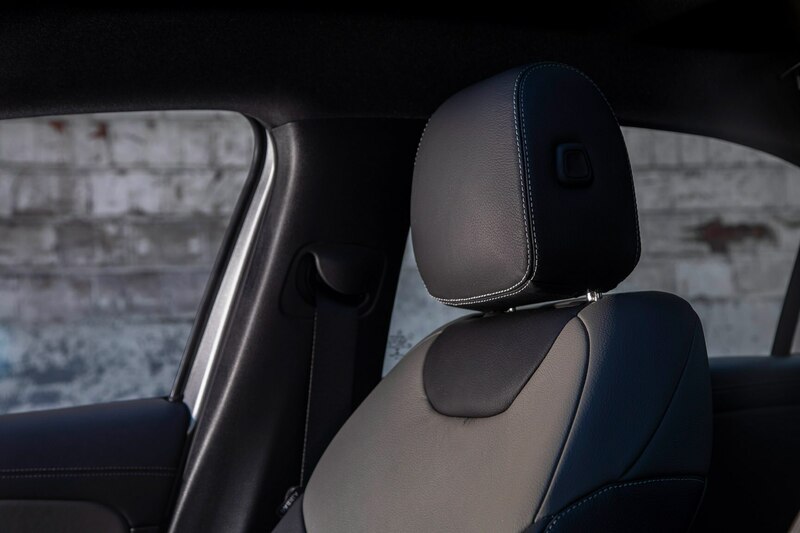 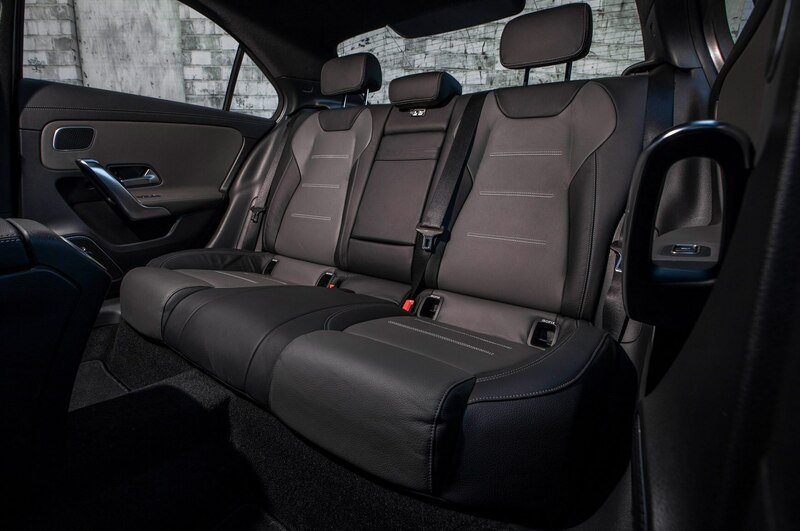 Move to the rear seats and you’ll find a more spacious rear cabin than in the CLA or GLA, though this is still a small car with limited room for those over six-feet tall. 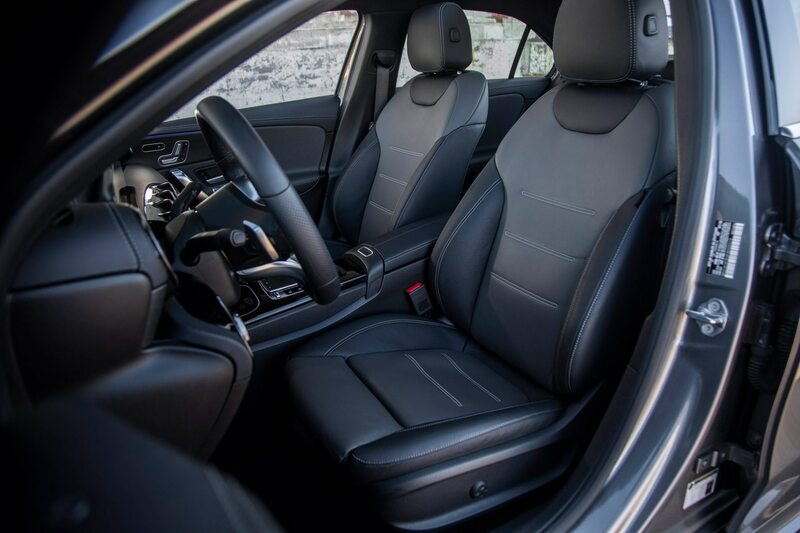 Really, rear seating is best kept to shorter trips for average-size adults, though smaller children will find plenty of space. 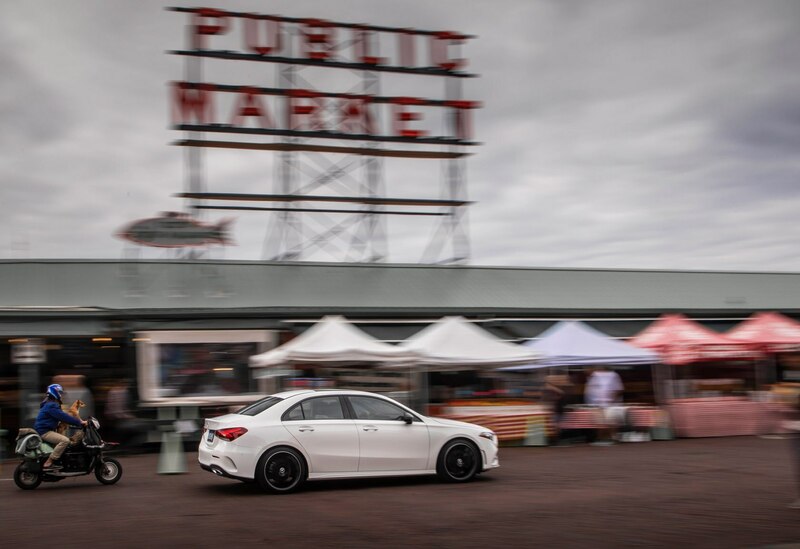 During the drive program, we logged miles on the city streets of Seattle, twisty mountain roads that circle Washington’s Mt. 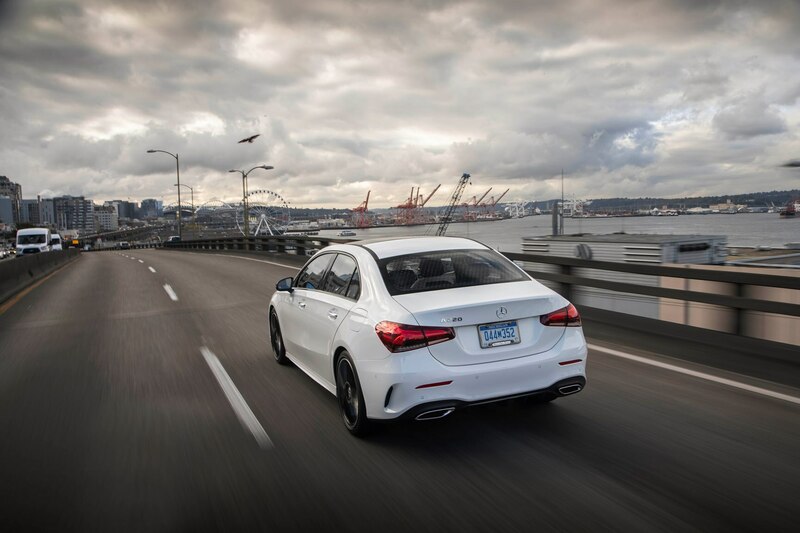 Rainer, and stretches of highway further east towards Yakima. 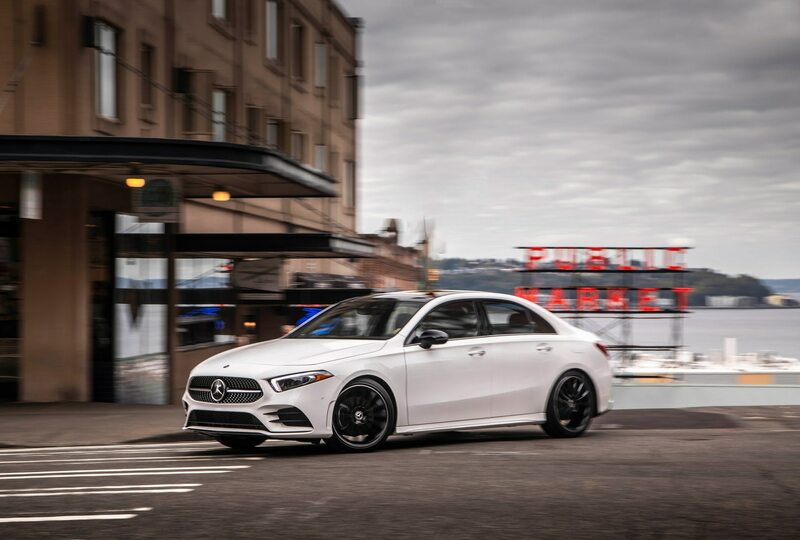 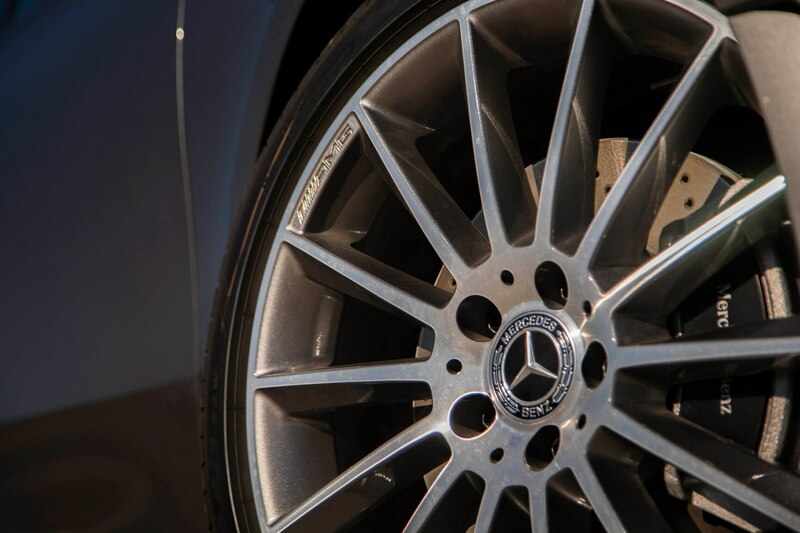 Our tester was a pre-production A220 4MATIC (designating all-wheel drive) equipped with 19-inch AMG wheels on low-profile summer tires and the AMG Line package with the lowered sport suspension (adaptive suspension is also an available option), drilled brake discs and various AMG trim items. 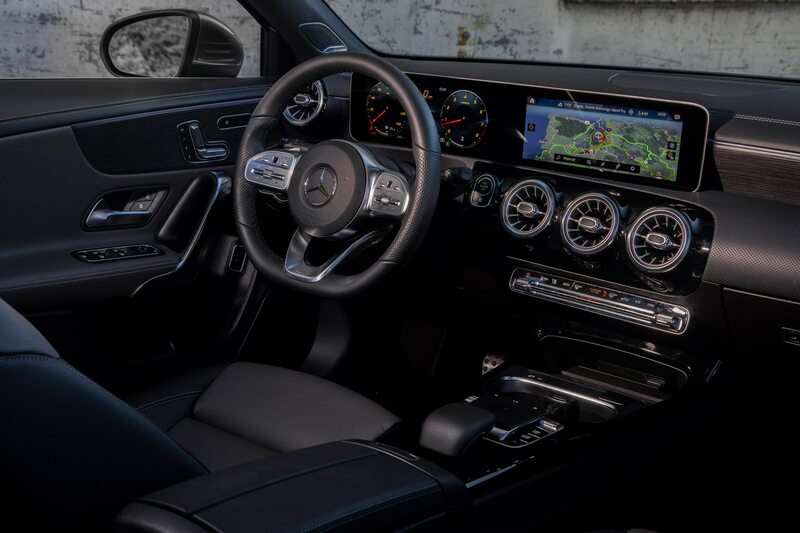 We found the ride to be on the firm side, as expected from such a setup, though still compliant enough that we don’t feel passengers would be unduly uncomfortable. 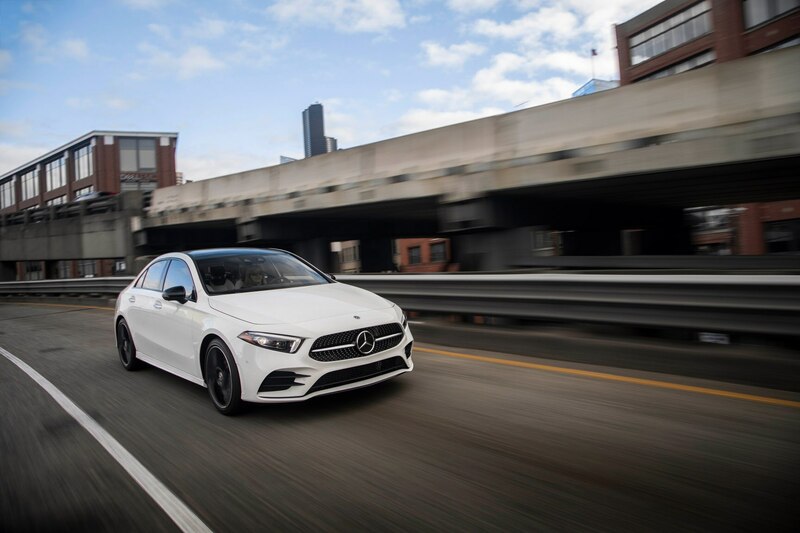 We’re confident that opting for the base suspension and 17-inch wheels would provide a more compliant ride though we weren’t able to experience a car so-equipped. 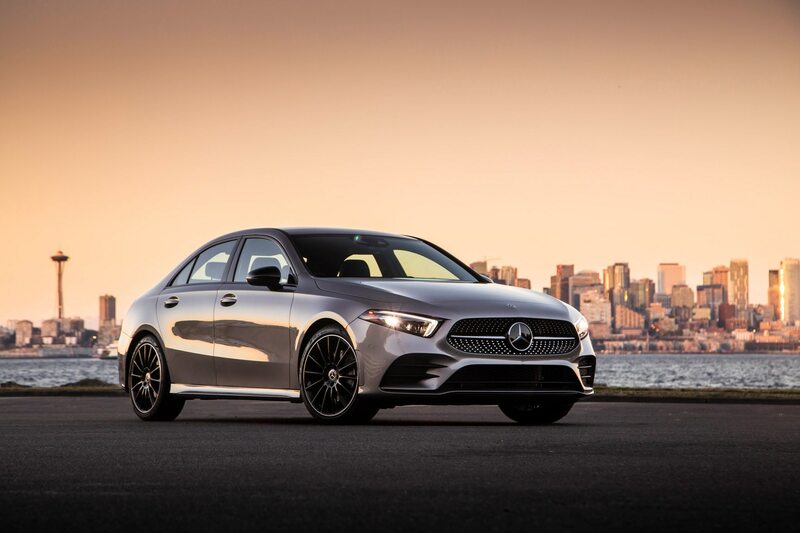 The new 2.0-turbo engine is impressively smooth and linear in its response, eager to run to its 6,500-rpm redline and with full torque feeling like it arrives arrive low in the rev range (Mercedes was unable to give us peak hp and torque rpm, leading us to conclude that final tweaking is still underway before the car’s launch in the first quarter of 2019). 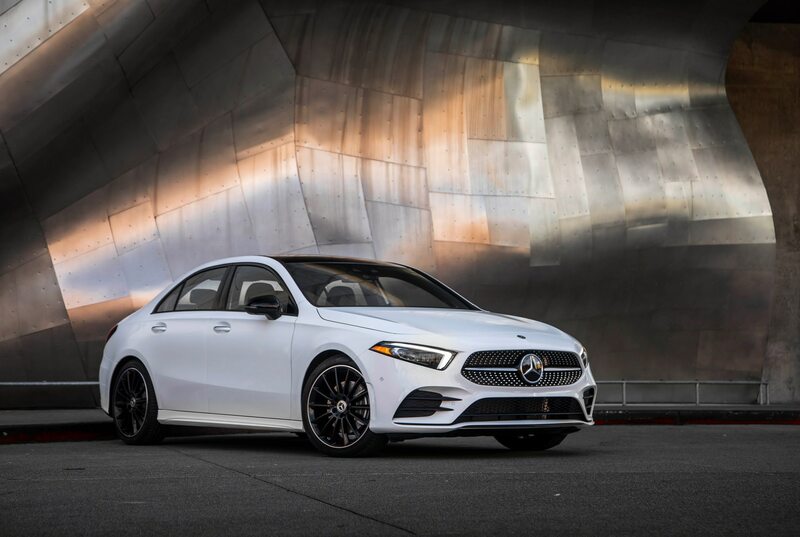 This is the A-Class’s base engine, and if 188 hp doesn’t sound like much, it doesn’t feel like it either and output is unfortunately significantly less than the CLA 250’s 208-hp, 258 lb-ft 2.0-liter turbo-four. 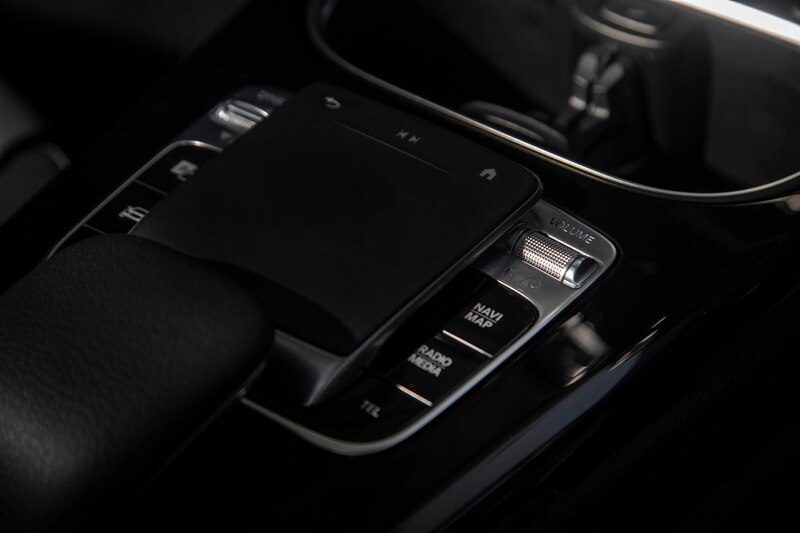 The 7-speed dual-clutch transmission is up to the task, with quick, smooth shifts whether in automatic mode or using the wheel-mounted paddle shifters. 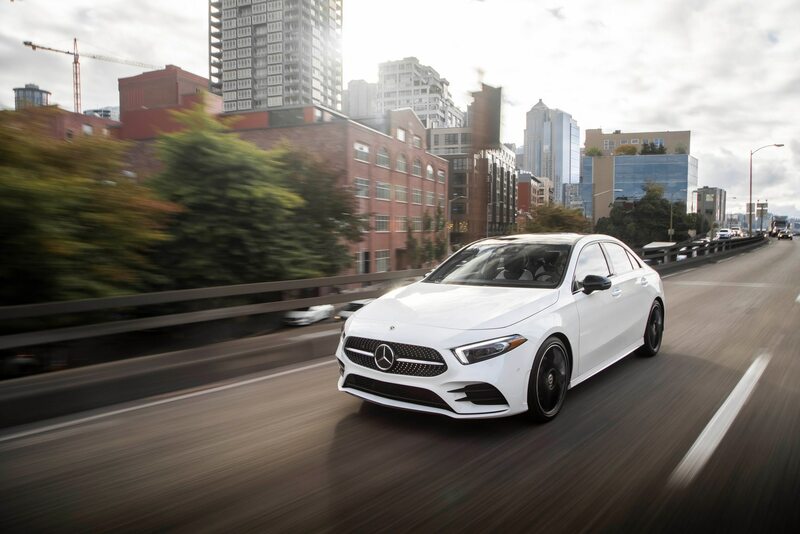 While the A220 is more than capable of keeping up with fast-moving traffic, the chassis is talkative and lively enough (especially with its sport options) that we couldn’t help but think what a future AMG version might be capable of. 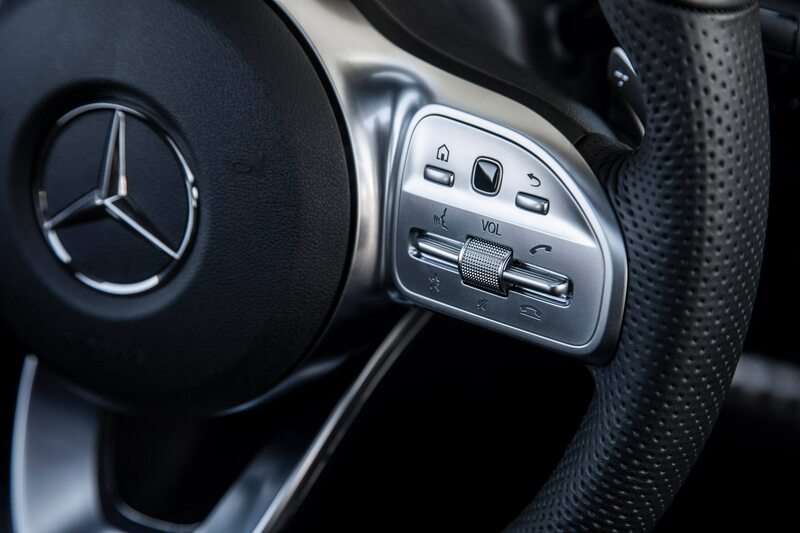 Mercedes used a new electric power steering setup on this A-Class which provides good feel and excellent weighting and precision, stiffening up nicely when the car is switched from Comfort to Sport mode, which also sharpens throttle tip-in, holds the seven-speed DCT’s gears longer before upshifting, and allows a little more slip before the ESC reins in the fun. 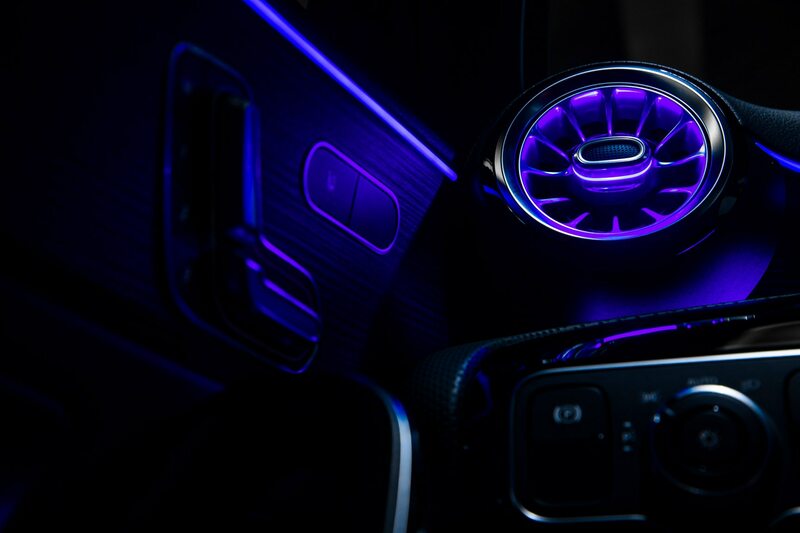 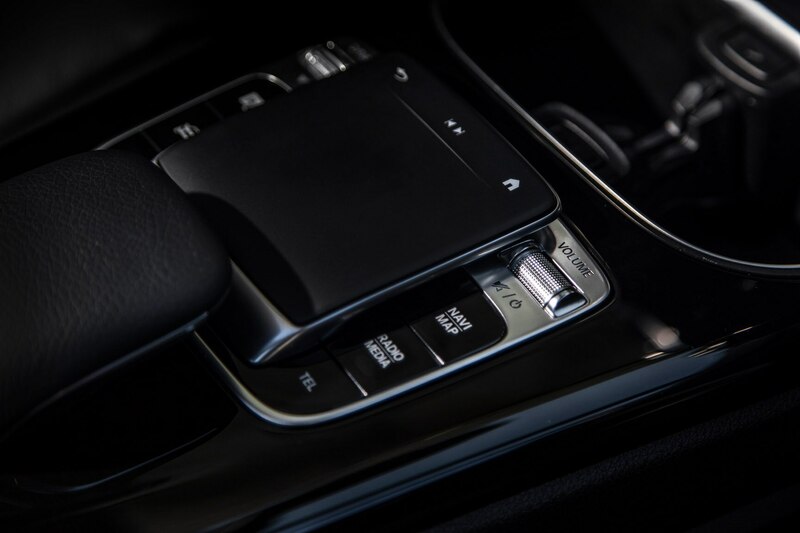 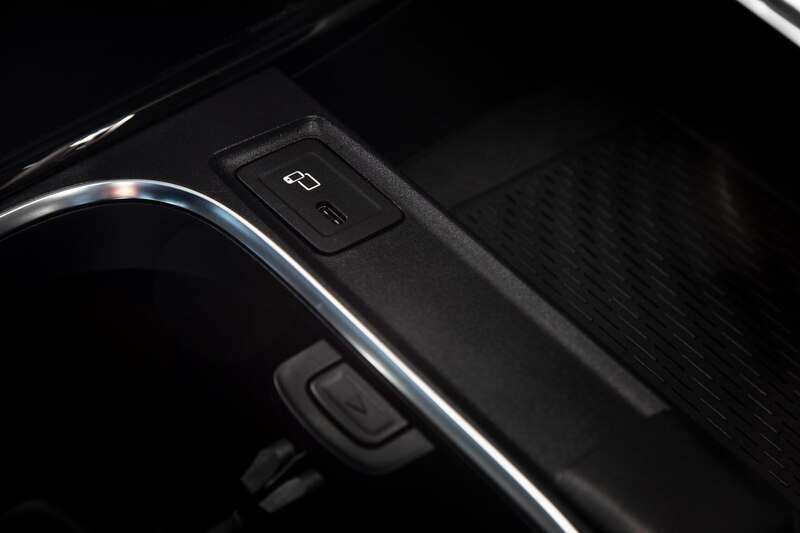 An Individual drive mode is also available to mix and match sport and comfort settings. 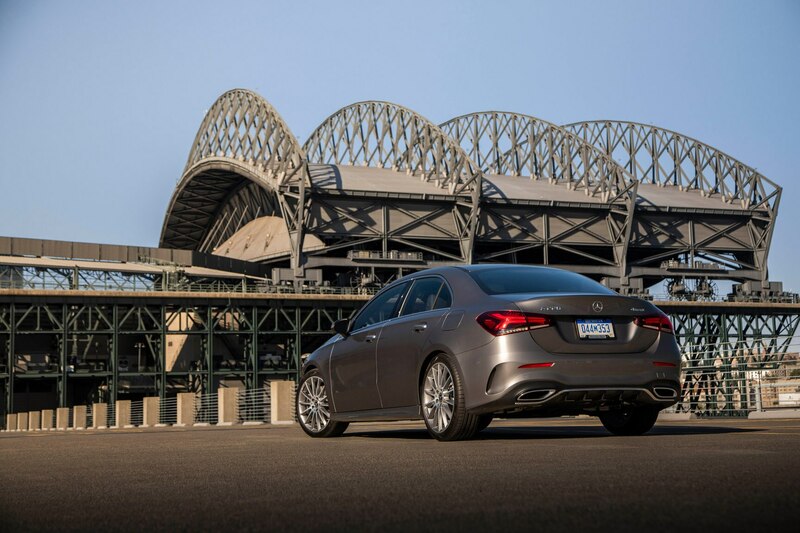 Is the sedan segment dead? 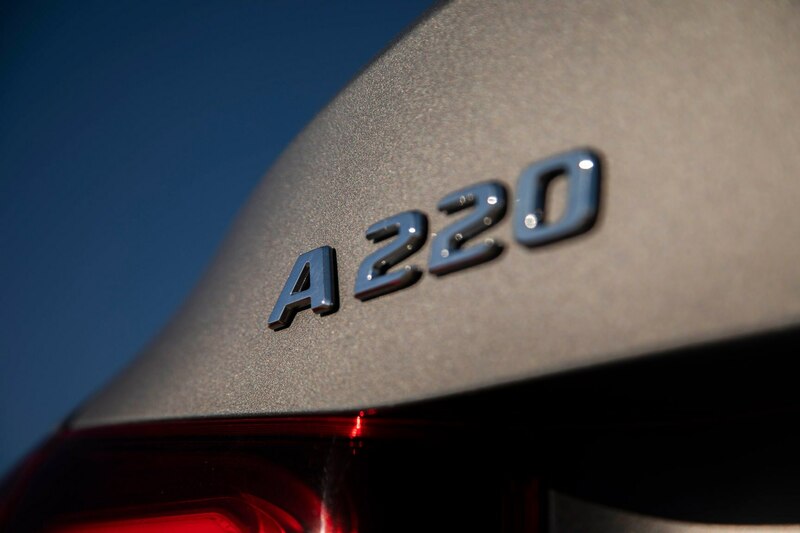 We certainly hope not if manufacturers can still bring fun-to-drive models to market like the A220. 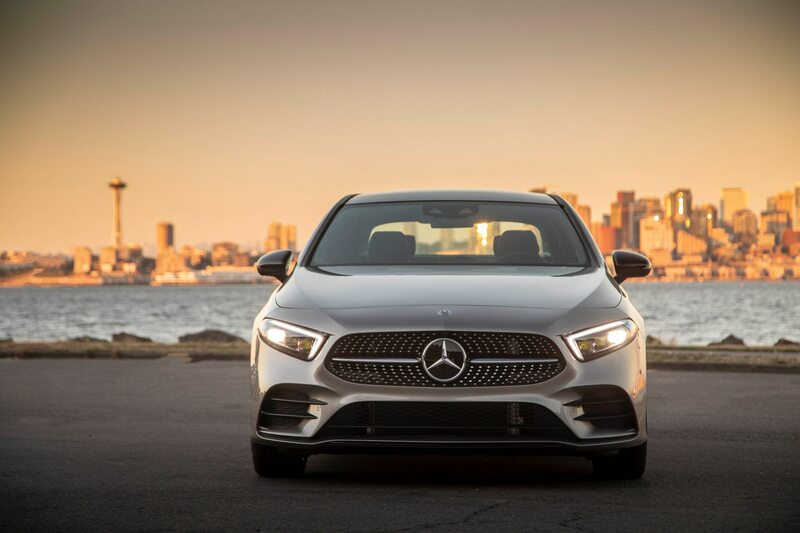 In our time with the car we came away very impressed and itching for more time in a full production version as we get closer to the A-Class sedan’s launch early next year. 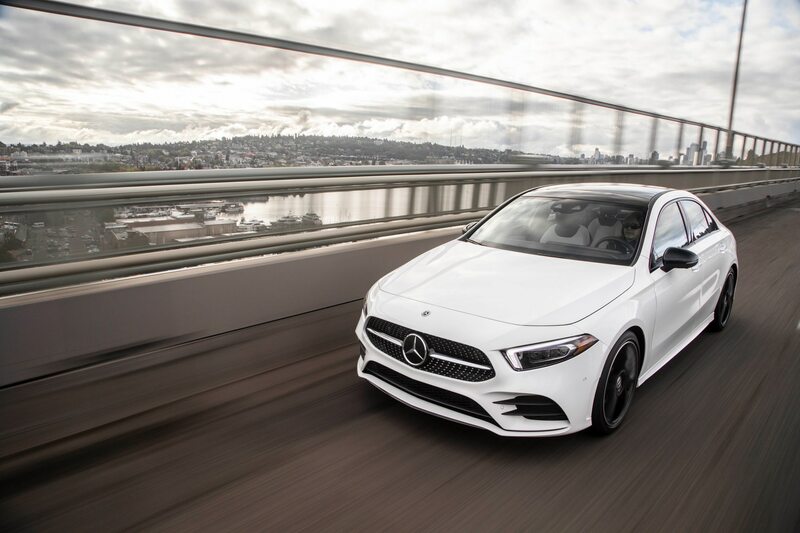 Mercedes is mum on pricing, though you can expect the A220 to start at roughly the same amount as the current CLA, or around $34,000 including destination fee, while the upcoming all-new CLA moves slightly upmarket.